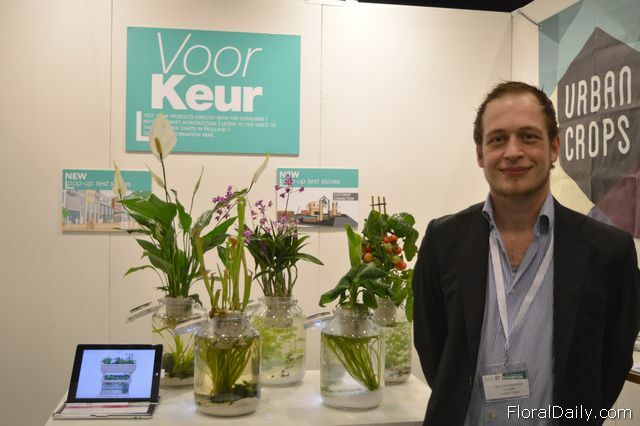 Nico de Jager of BureauSierteelt, one of the organizers of the show. 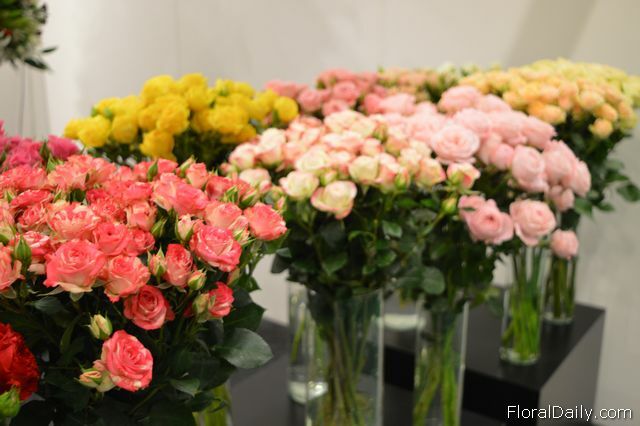 Bas ter Laare of Upendo Flowers. 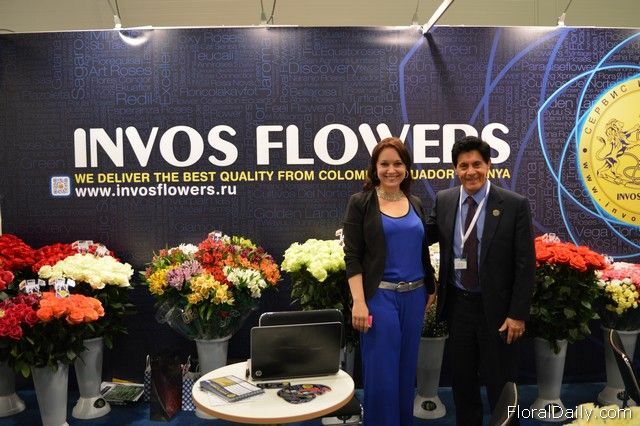 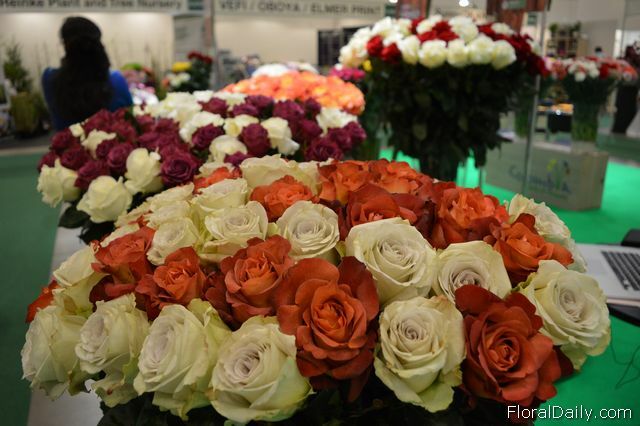 Nadezda Tsarenko and Oscar Silva Montejo from Invos Flowers Export. 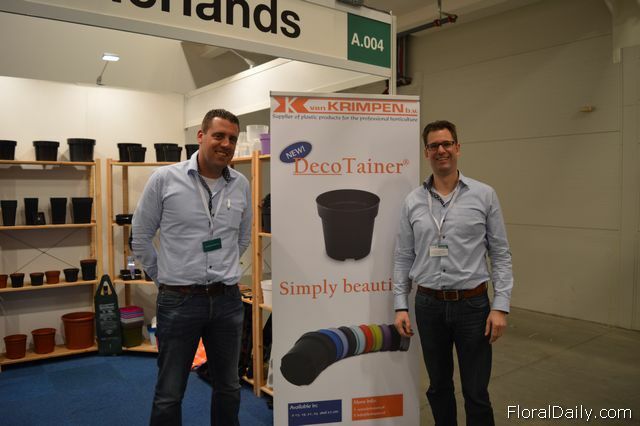 Joost Thijssen and Jorg Swagemakers from Van Krimpen. 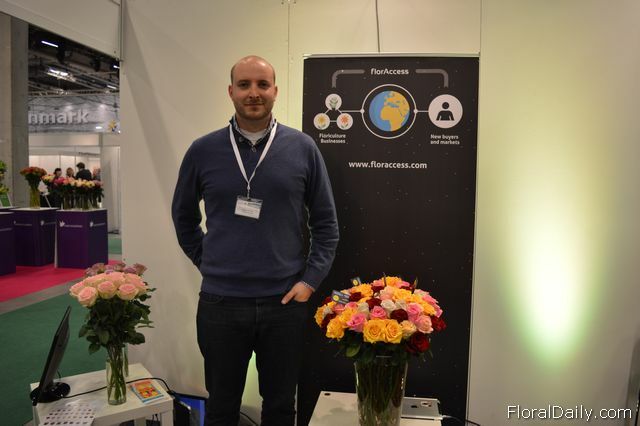 Kuno Jacobs, managing director of Nova Exhibitions. 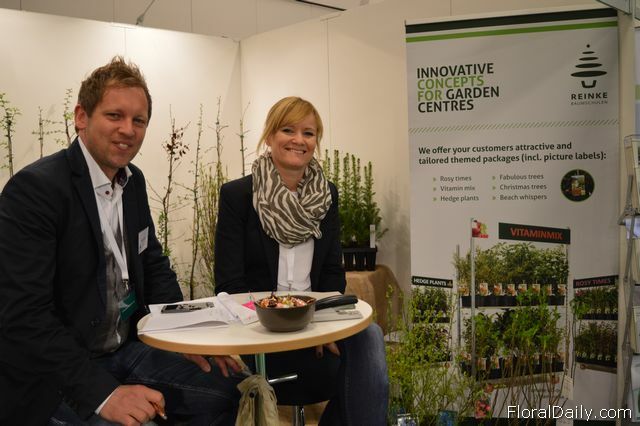 Maurice Langelaan and Anna Liljeqvist from Karma Plants. 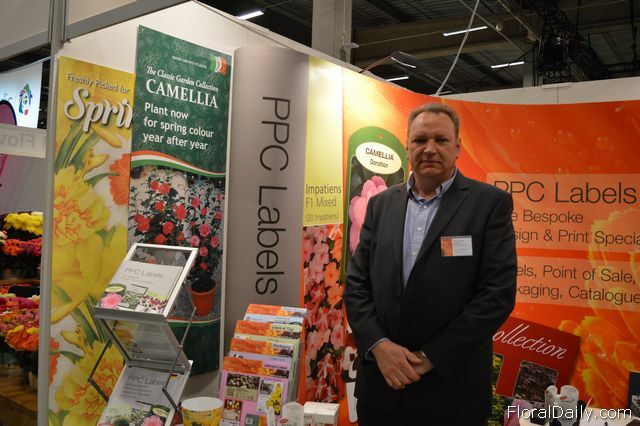 Jeremy Watkinson of PPC Labels. 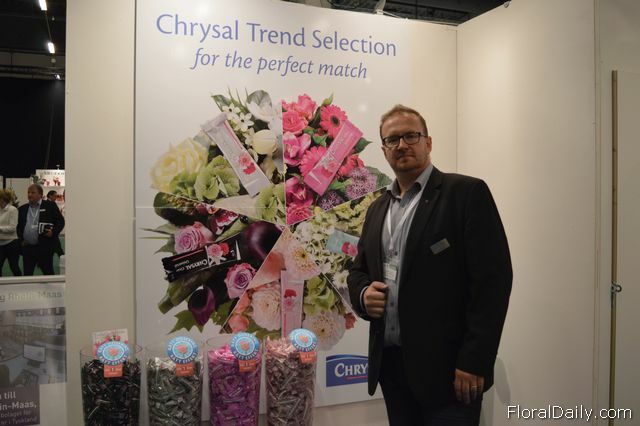 Fredrik Engvall of Chrysal Nordic. 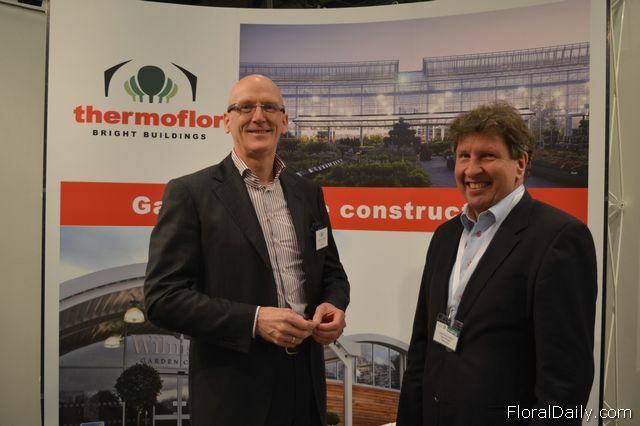 Ferry Breugem and Matts-Erik Lindqvist of Thermoflor. 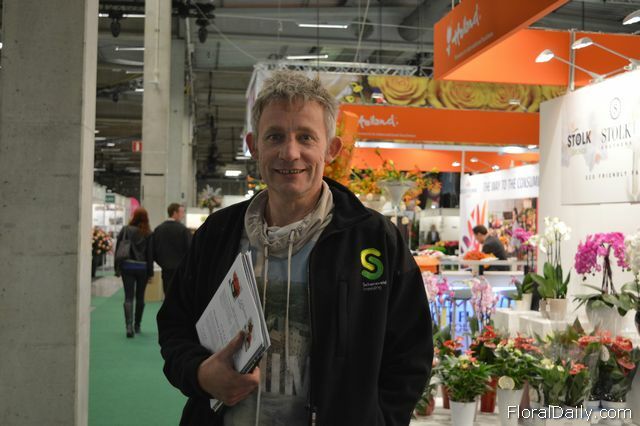 Johnny Rasmussen of SOGO Team. 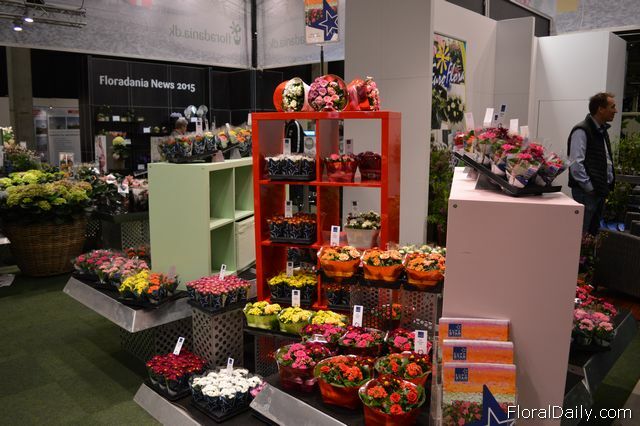 The booth of Rosa Danica. 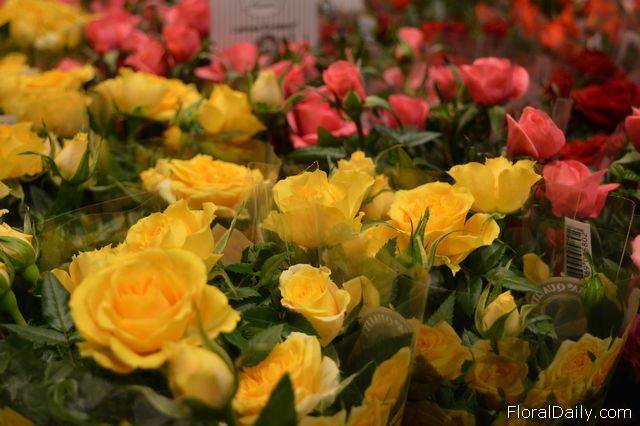 The roses of Rosa Danica. 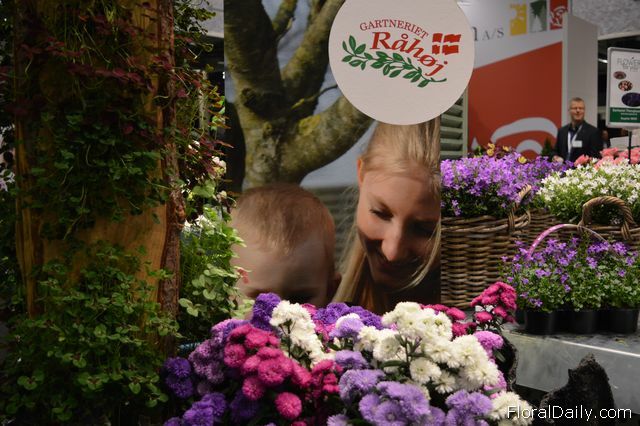 The booth of Gartneriet Råhøj. 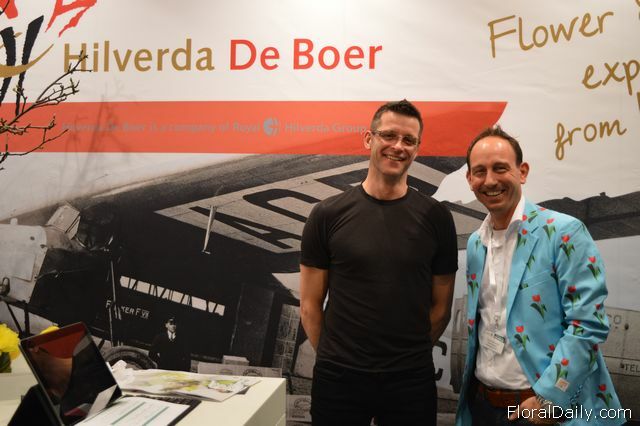 Ton de Haan and Kees Cusell of Fred. 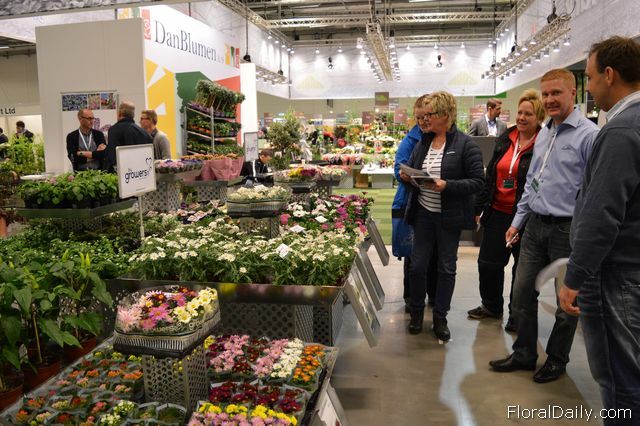 De Meulder with Leendert van Geest and Ben van Geest. 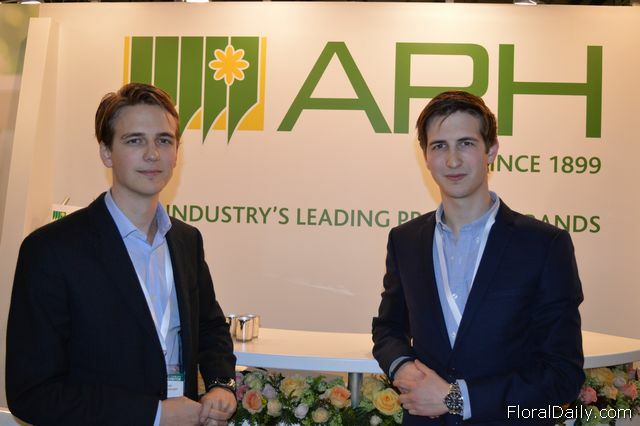 Adam Muhr and Jakob Muhr of APH. 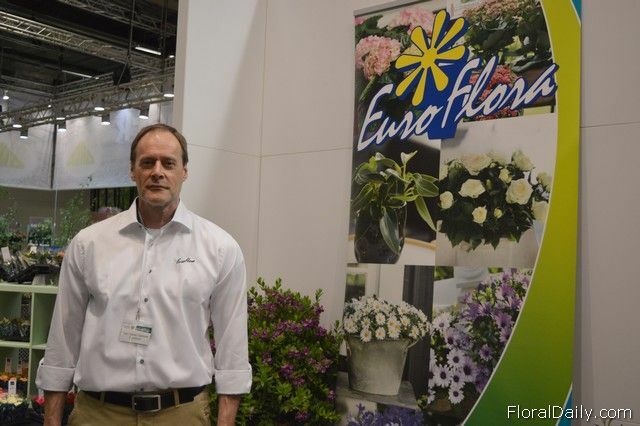 Guido Zwart of Esmeralda farms. 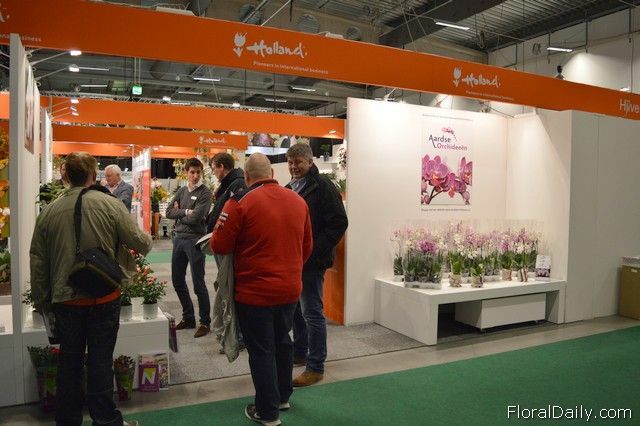 Busy at the Holland Pavillion. 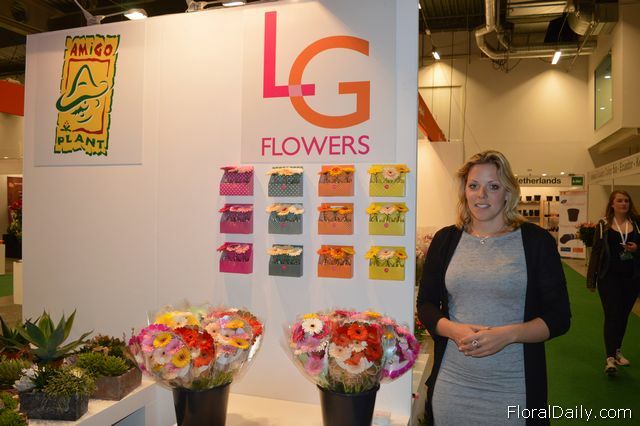 Joyce Lansbergen of LG Flowers. 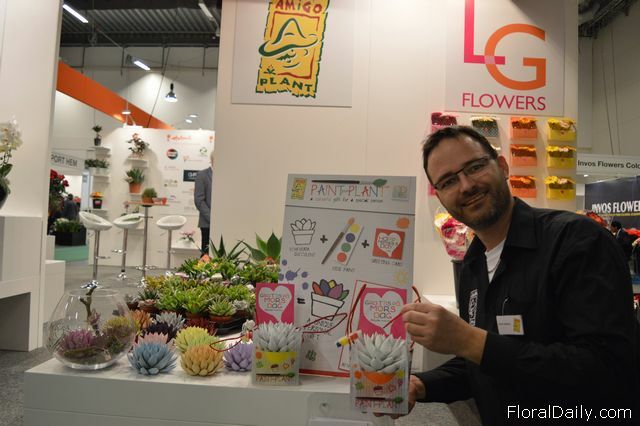 Jacco Huibers of Amigo Plant. 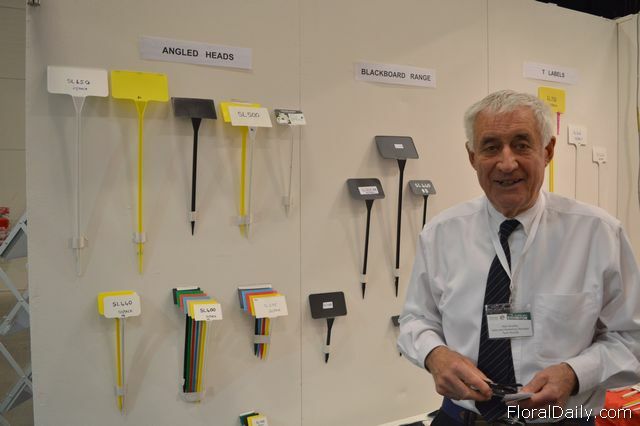 Wit the Paint Plant. 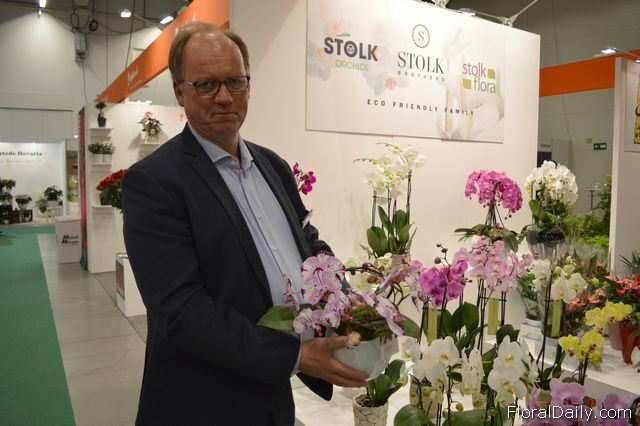 Frans Mourits of Stolk Flora with the angel. 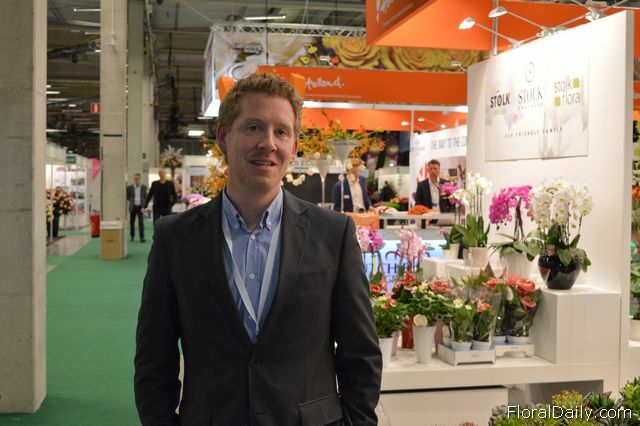 Jan Renting of Optimal Connection. 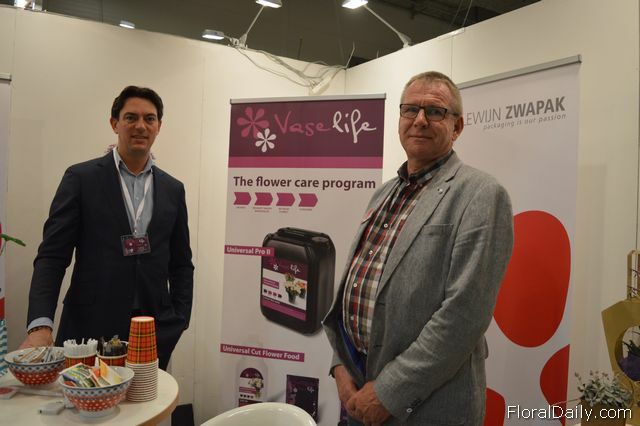 Nick MacDonald of Vaselife International and Jan Groen of Dillewijk Zwapak. 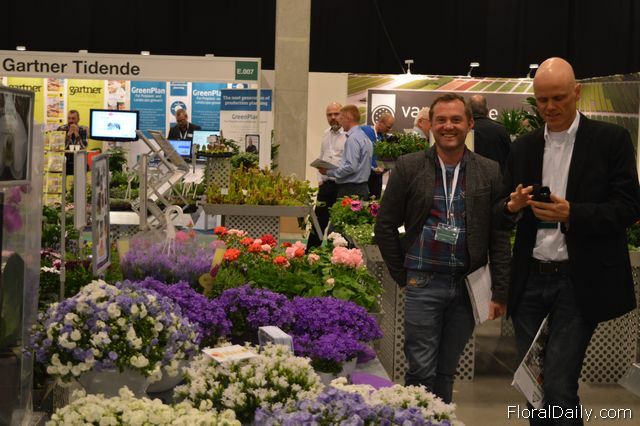 Mark van der Weegen of Gustafssons and Dennis de Gooijer of Hilverda De Boer. 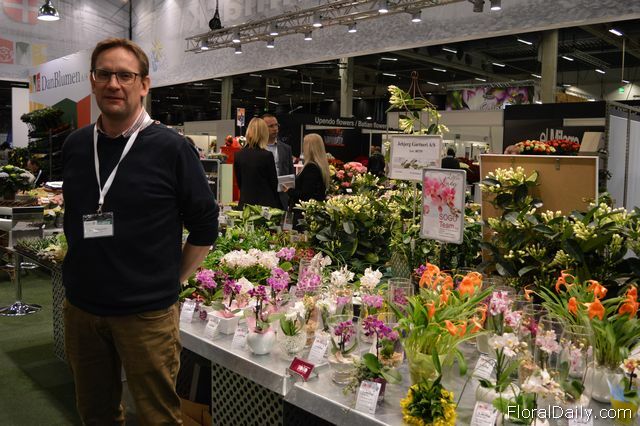 Mark imports the flowers of Hilverda De Boer. 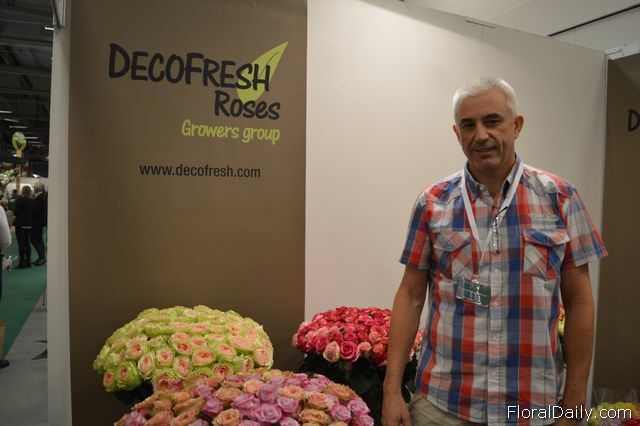 Matti Arielle of Decofresh Roses. 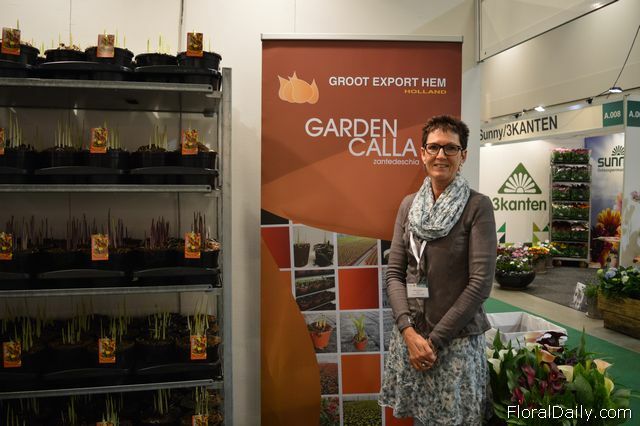 Betty Venema of Groot Export Hem. 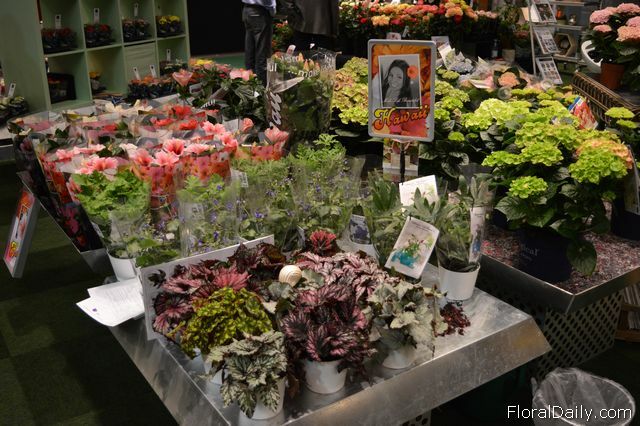 They supply 5-6 week old callas to growers. 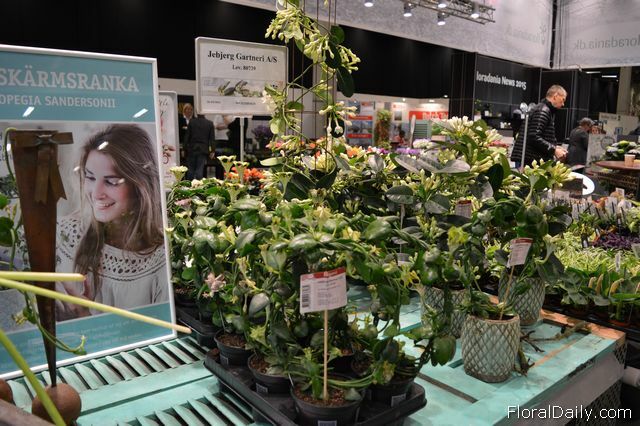 According to Betty, the first stage of growing the callas is the most difficult stage. 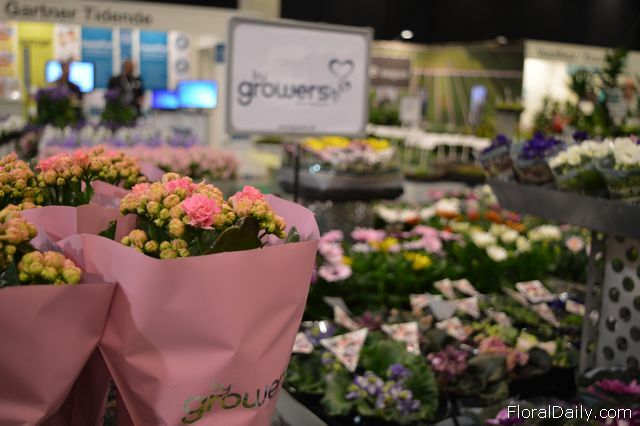 After 5-6 weeks, the growers only have to water them in order to grow them to finished plants. 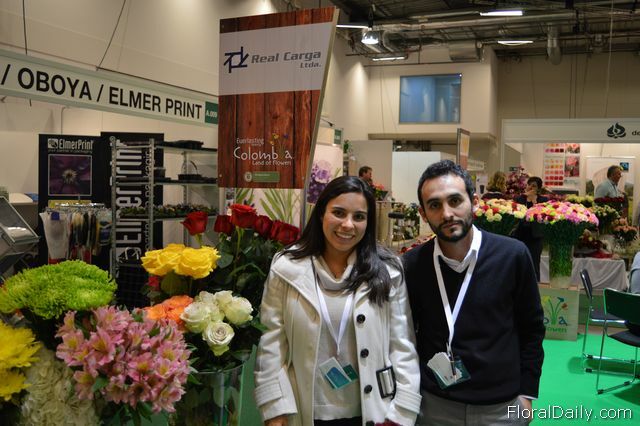 Andres Felipe Bernal B. and Diana Bernal of Real Carga. 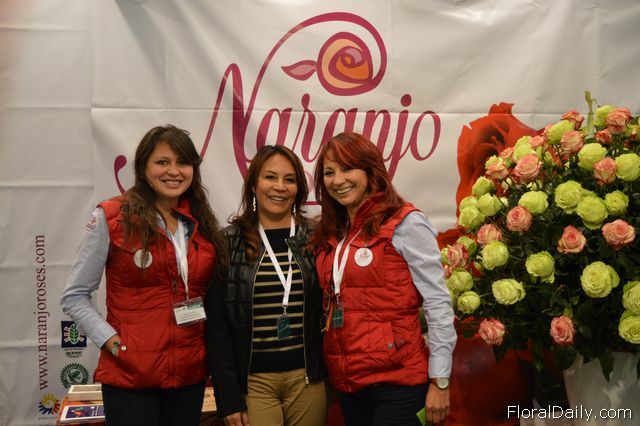 Laura Gomez,Maryluz Naranjo and Litia Naranjo of Naranjo Roses. 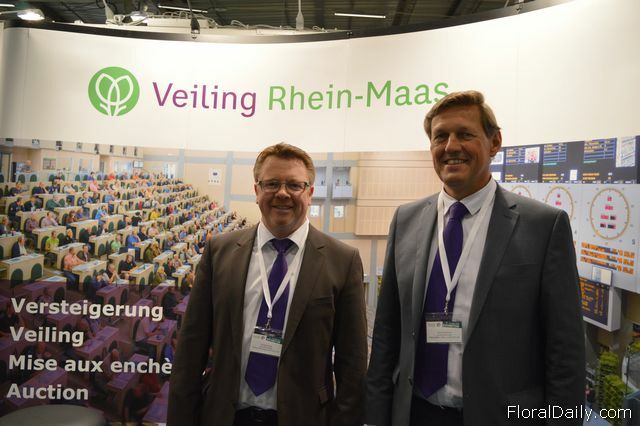 Wolfgang Maas and Theun Brinksma of Veiling Rhein-Maas. 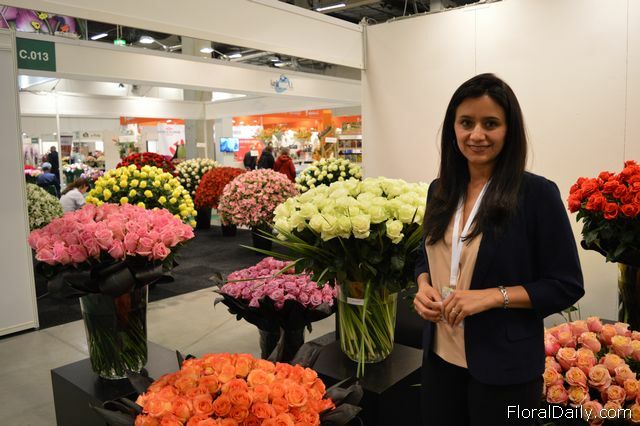 Ana Maria Jaramillo of Florecot. 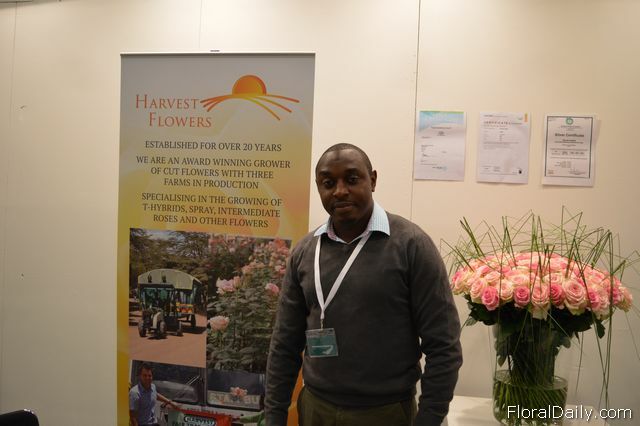 Gilbert Gathu of Harvest Limited. 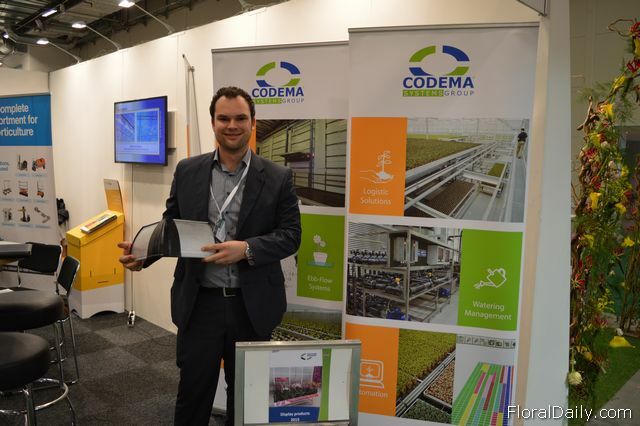 Jelmer Huizing of Codema with the new corner piece to cover the corners of front card holder of presentation tables of garden centers. 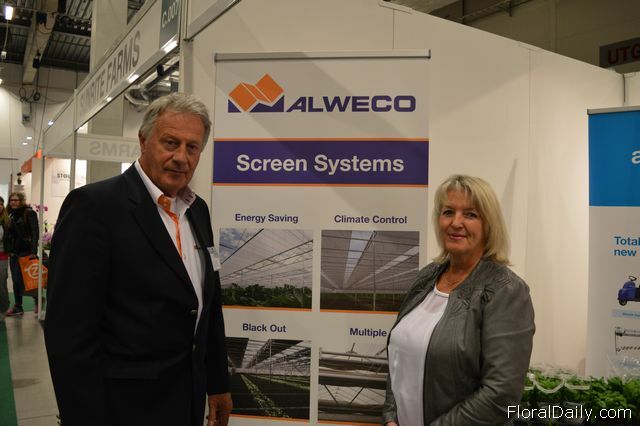 Wim Vermeilen and Tanne Vermeulen of Alweco. 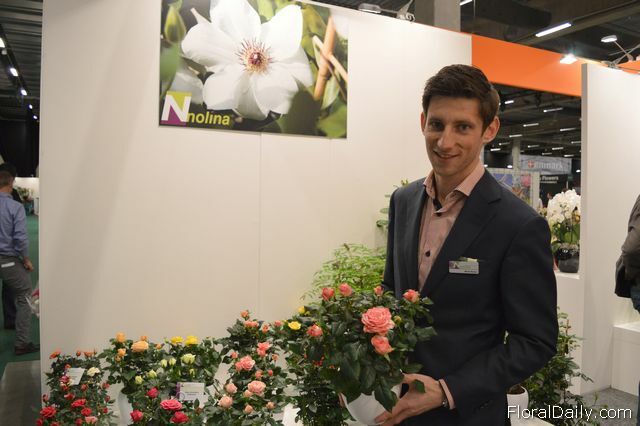 Henrik Boeriths of Rosa Danica holding the Rosaroma; a scented rose. 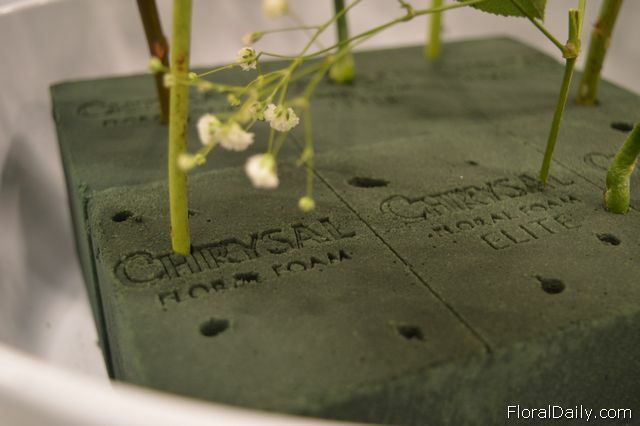 The new foam of Chrysal. 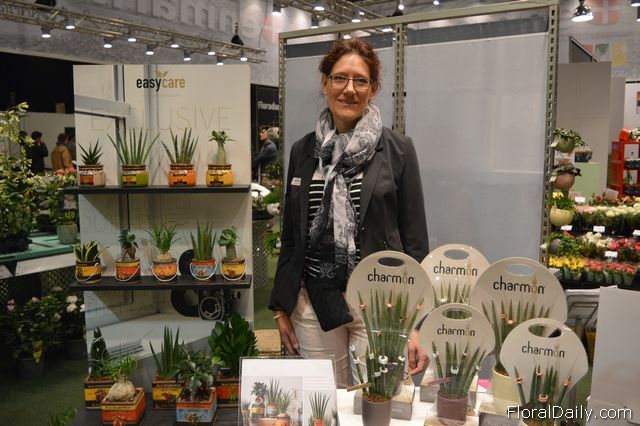 This foam absorbs more water and is very solid. 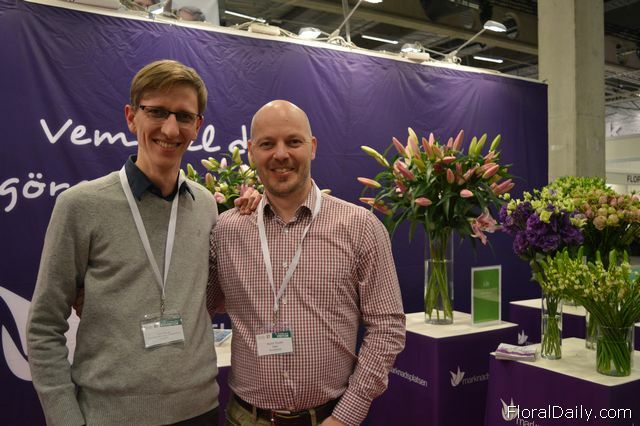 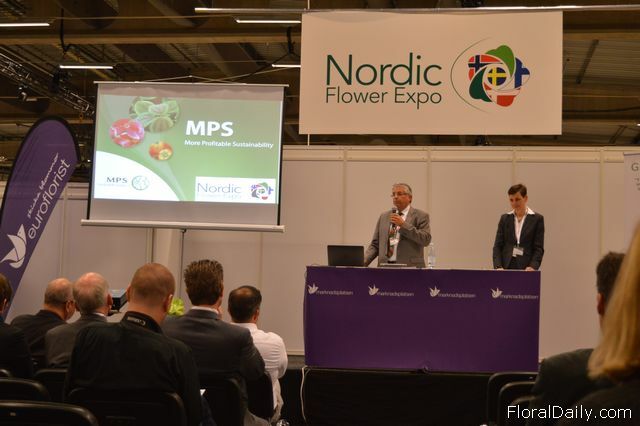 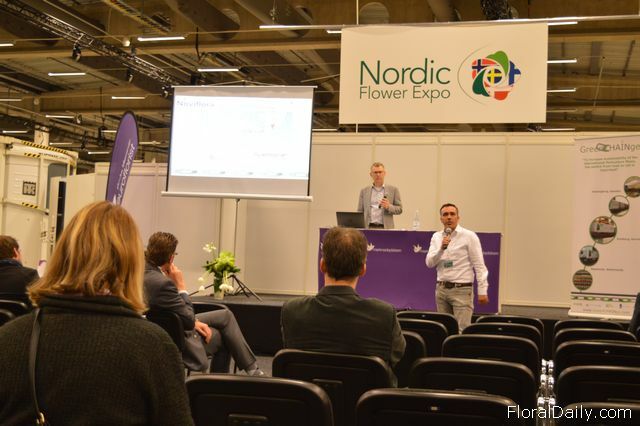 Rune Thorup and Martin Thysell of Euroflorist. 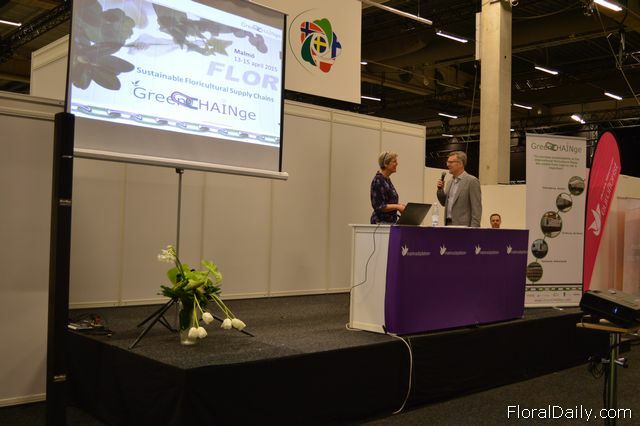 Renske Nijland of the Embassy of the Kingdom of the Netherlands opens the seminar about sustainable floricultural supply chains. 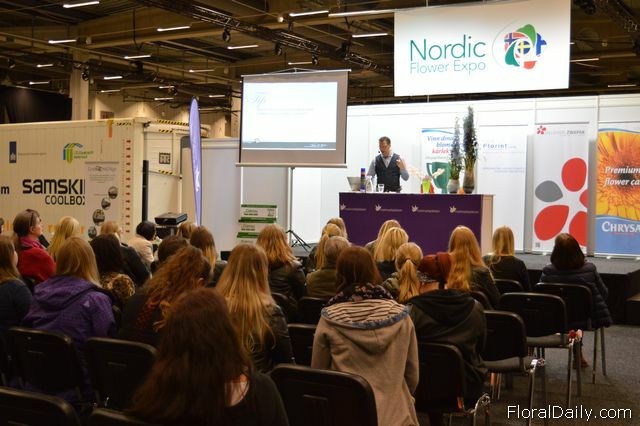 Large interest for the Seminar. 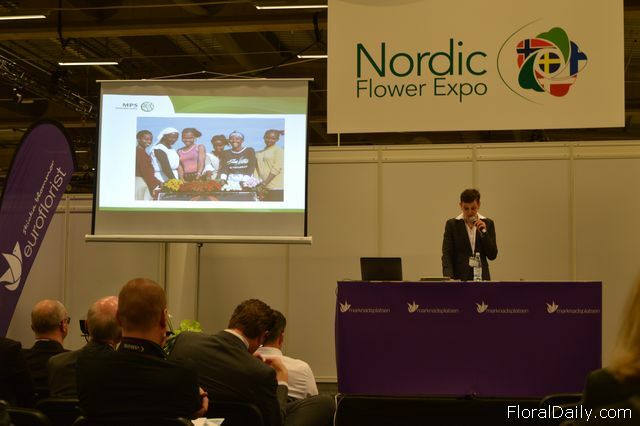 Anton Bril of VGB talking about the Greenchainge project. 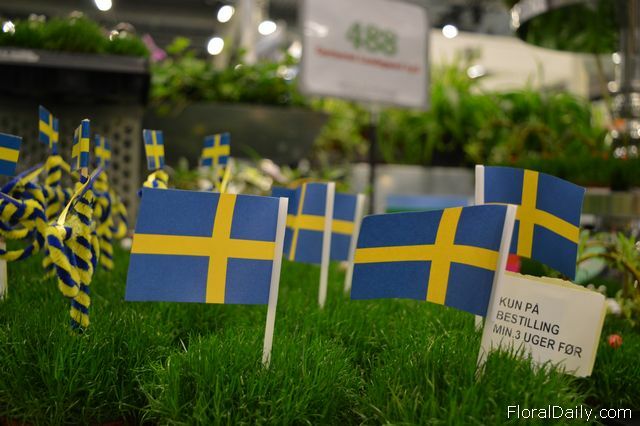 Their goal is to decrease the carbonoxide output by using the railway transport. 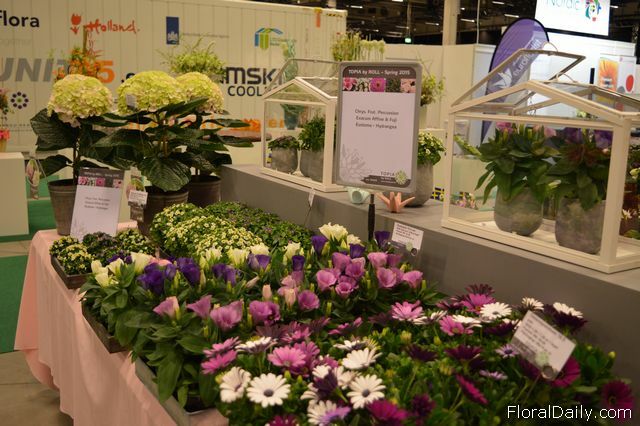 The container used for this project can be placed on a truck and afterwards on a train. 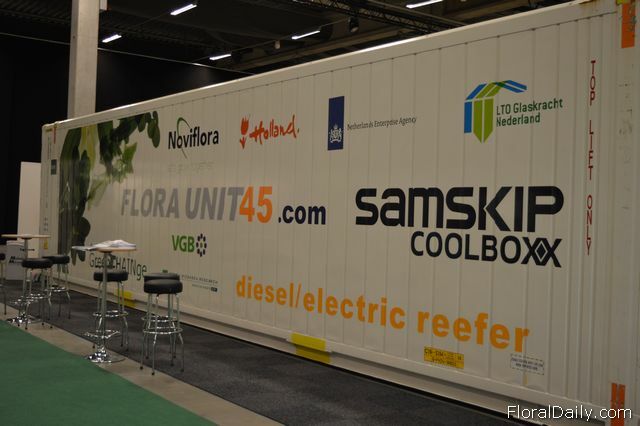 Guy Paterson of Noviflora takes part in the Greenchainge project and tells about his experience with the diesel-electric reefer container. 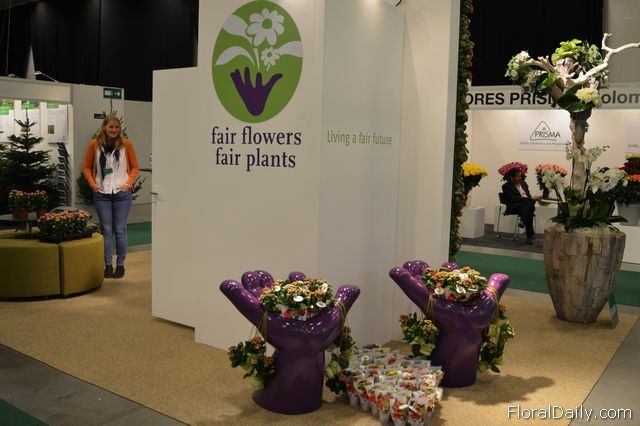 Kitty Bruyn talking about the Fair Flowers Fair Plants concept. 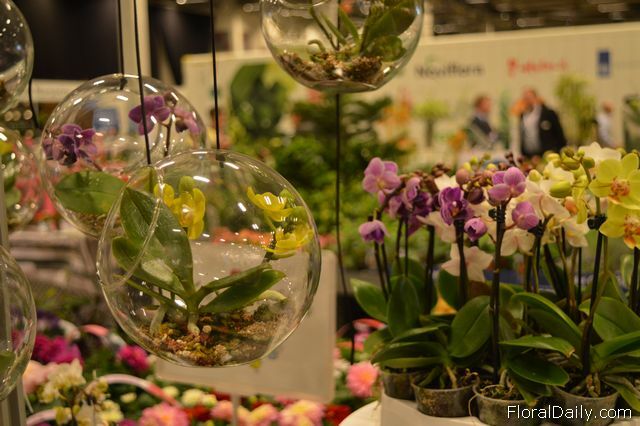 The glass bowls of Naeldebakken. 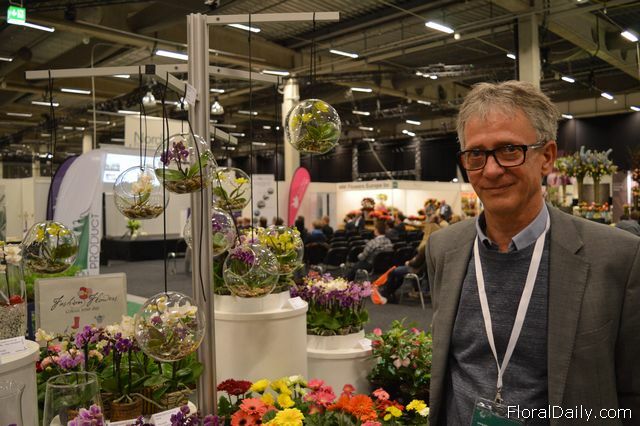 Bent Hansen Hvidberg of Naeldebakken. 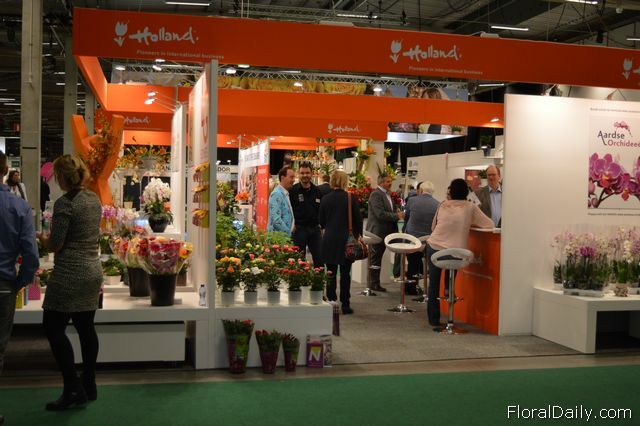 After the seminar about sustainable floriculture, a reception was organized by the Dutch Embassy. 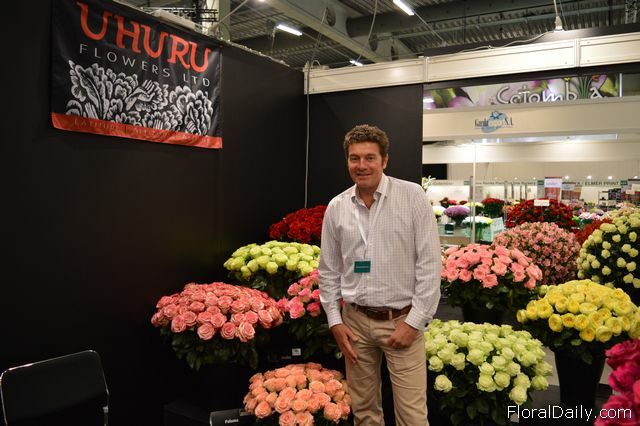 Ivan Freeman of Uhuru Flowers. 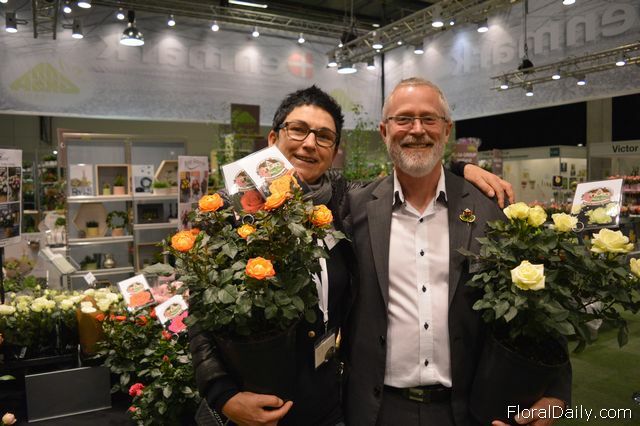 Rosa Eskelumd of Roses Forever and Erik Andersen of Hoejgaard Plant. 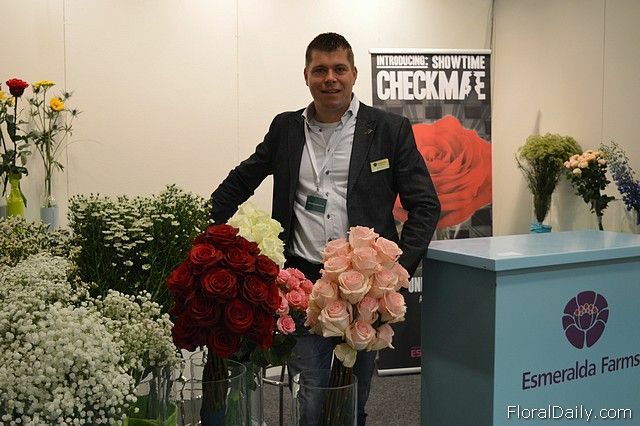 Erik grows the Roses Forever that Rosa Eskelund breeds. 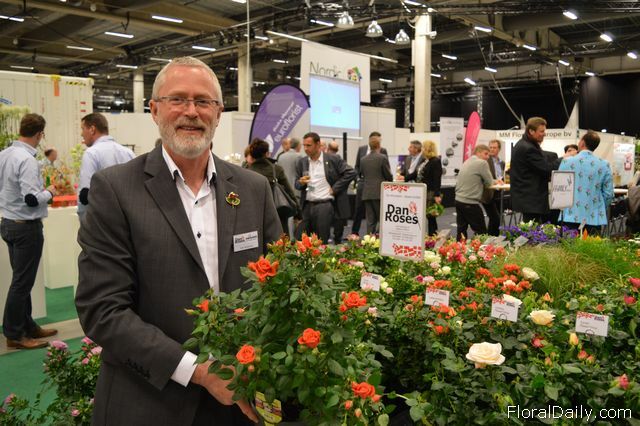 Next to growing Roses Forever of Rosa Eskelund, Erik Andersen also grows other pot roses. 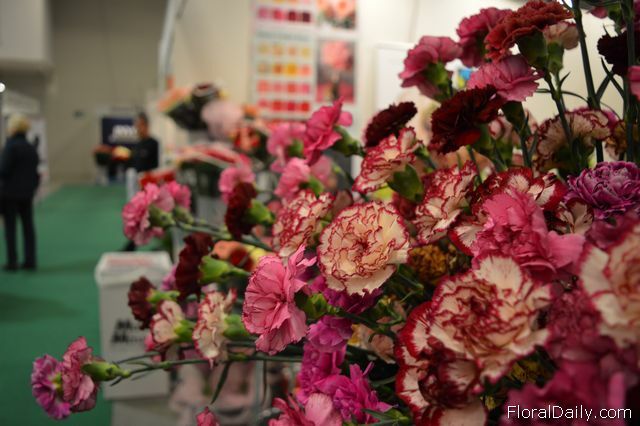 The booth of Fashion Flowers. 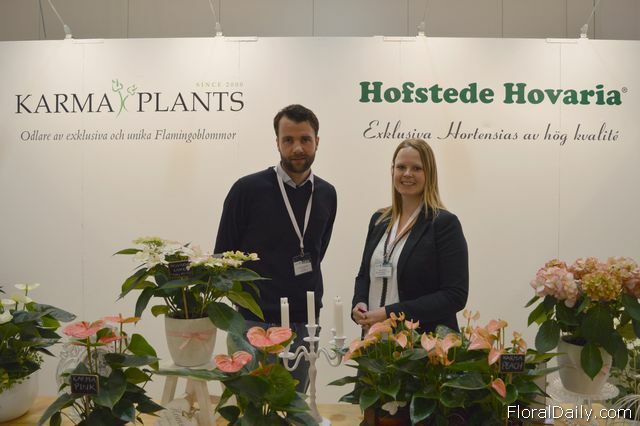 The booth of Gartneriet Kortegaard. 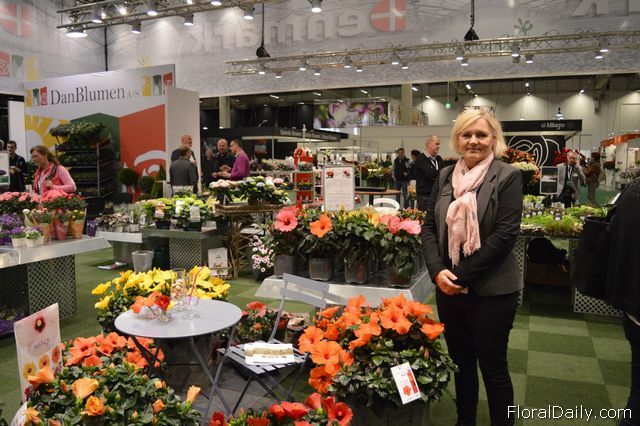 The Grand Diva of by Growers. 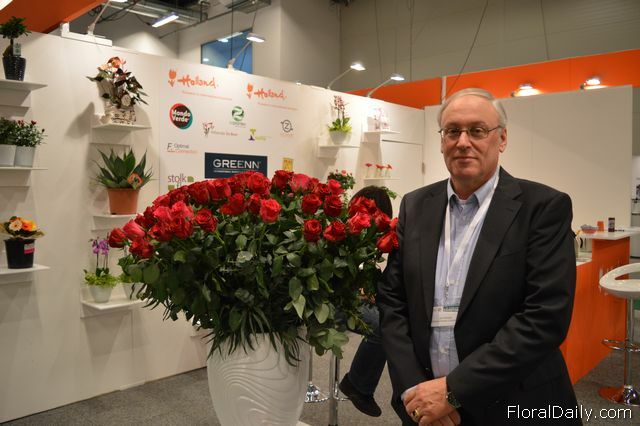 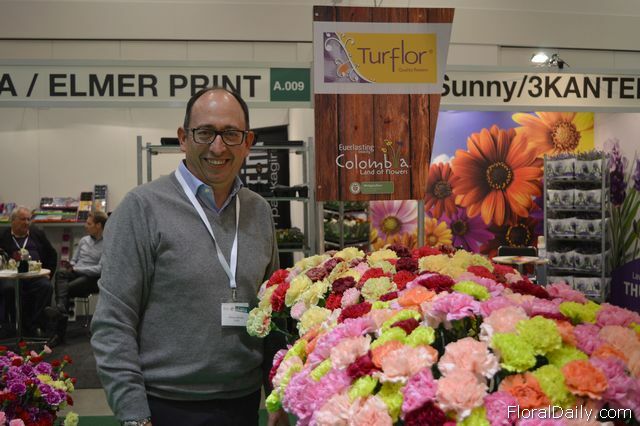 Lars Goran Ojarsedt of Euroflora. 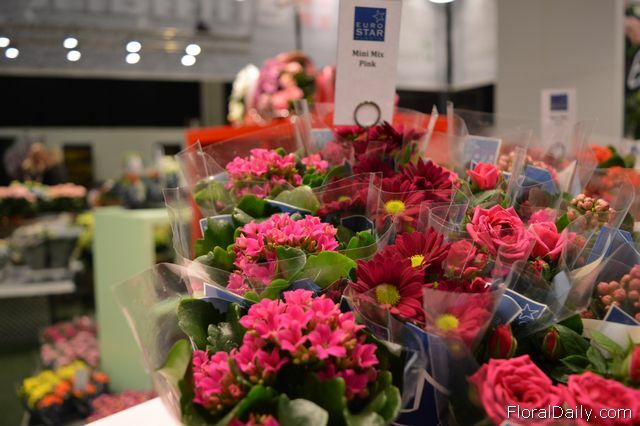 The mini Mix Pink of Eurostar. 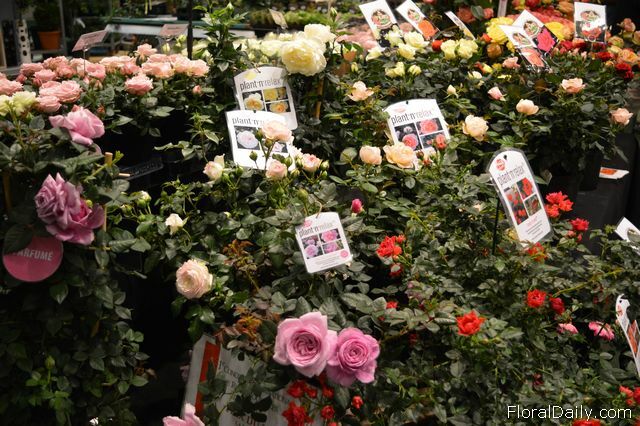 Plant'n Relax collection of Roses Forever. 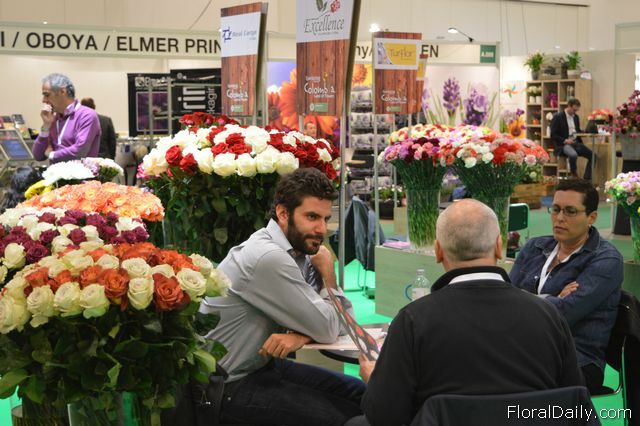 Exhibitors talking with each other. 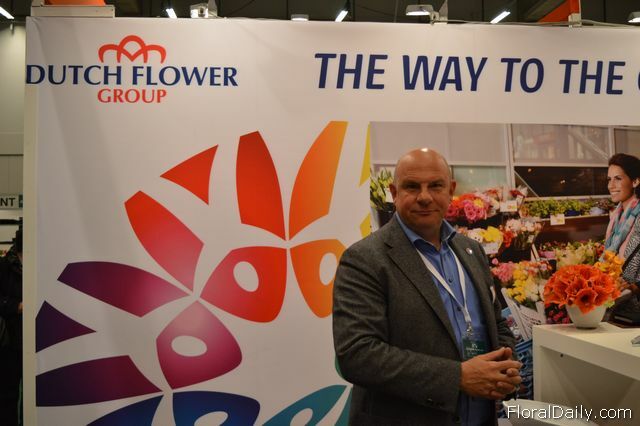 The booth of Hawai Gartneriet. 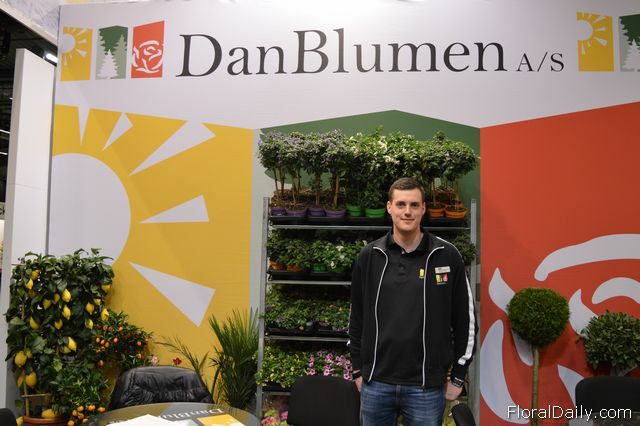 Nicolai Thode Lovkvist of Dan Blumen. 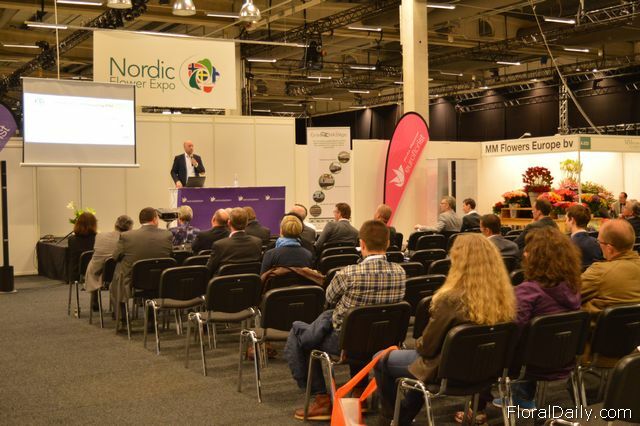 Hendrik Madsen of Gartneriet PKM. 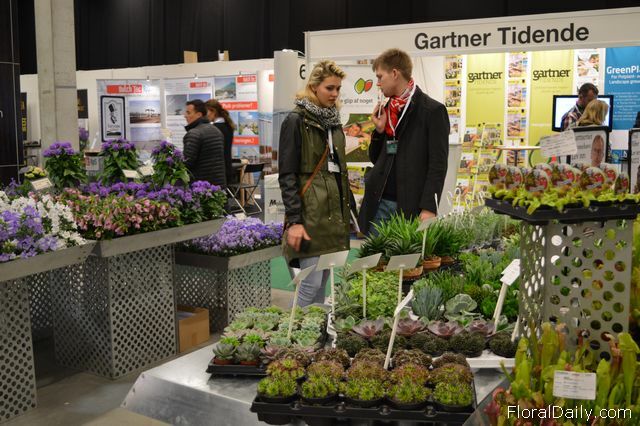 The booth of Gartneriet Fohlmann. 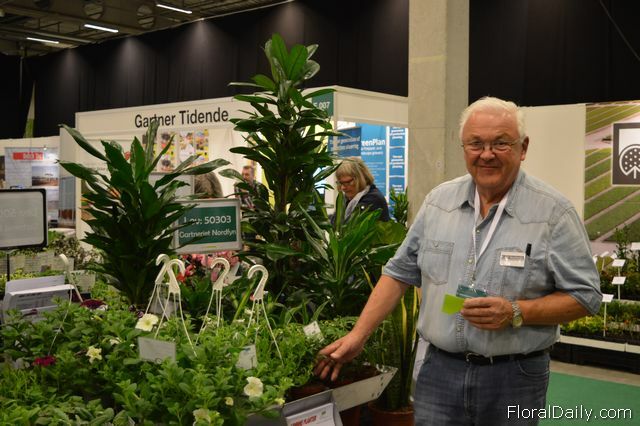 Leif Madsen. 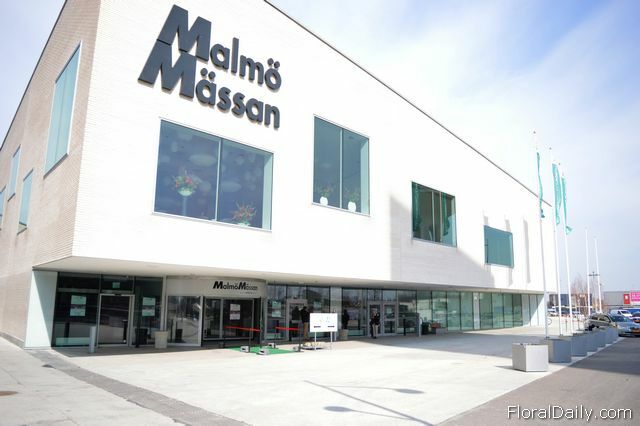 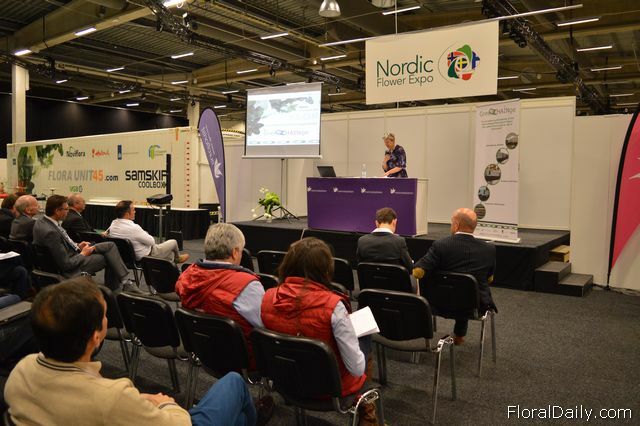 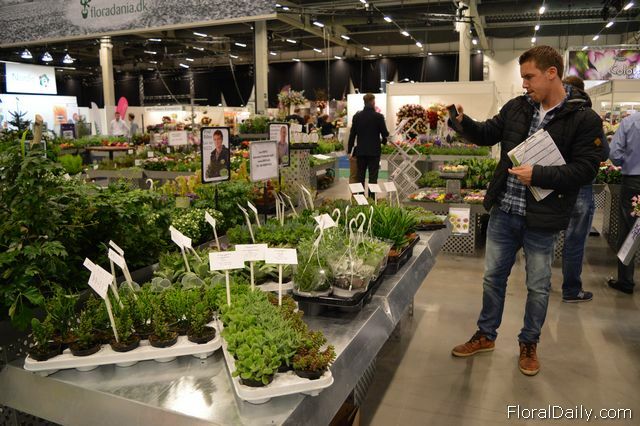 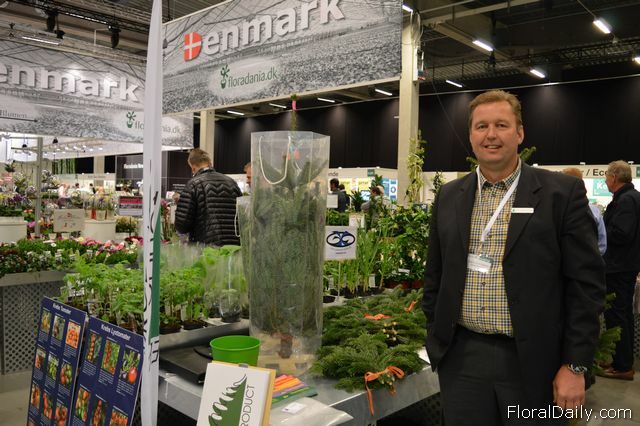 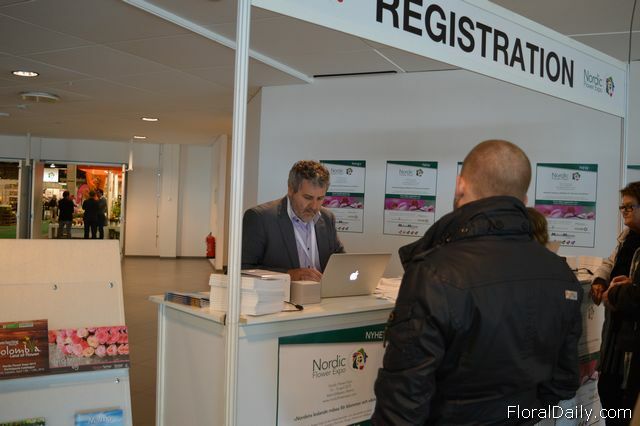 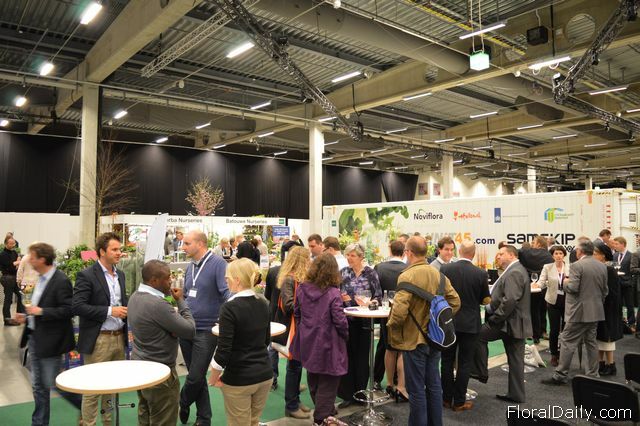 He is the salesman of 18 Danish growers that are present at the show. 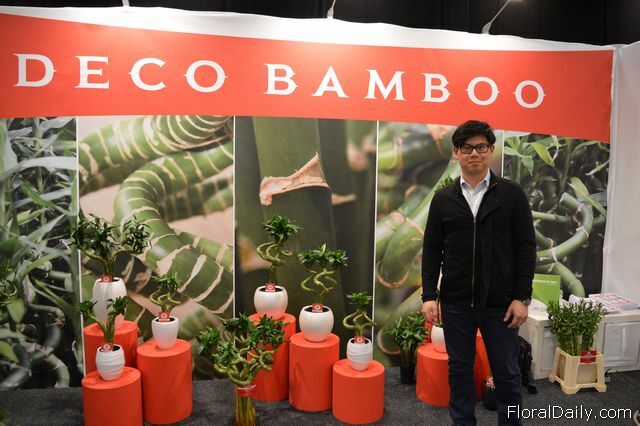 Lucas Lee of Victor Deco Bamboo. 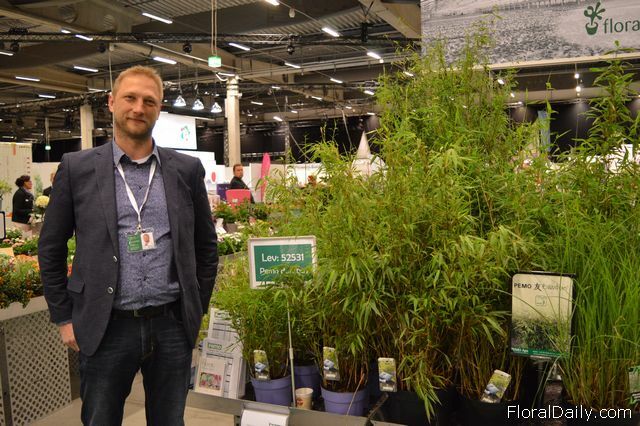 Boris Roodenburg of Urban Greeners. 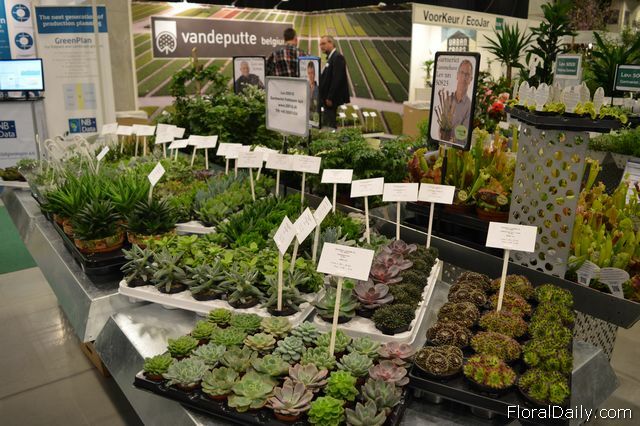 He assists Bureau Siierteelt with the Project Voorkeur. 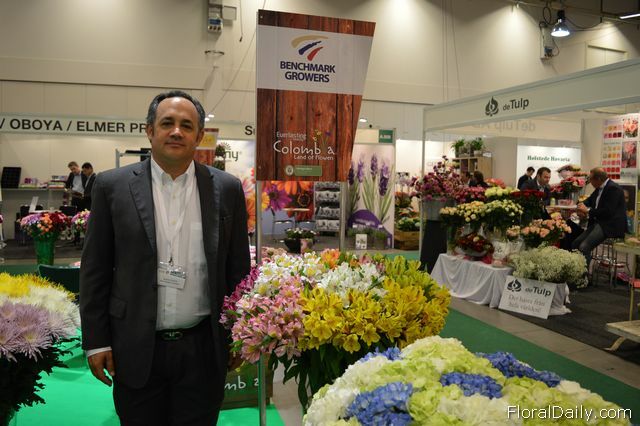 Ignacio Gomes of Benchmark Growers. 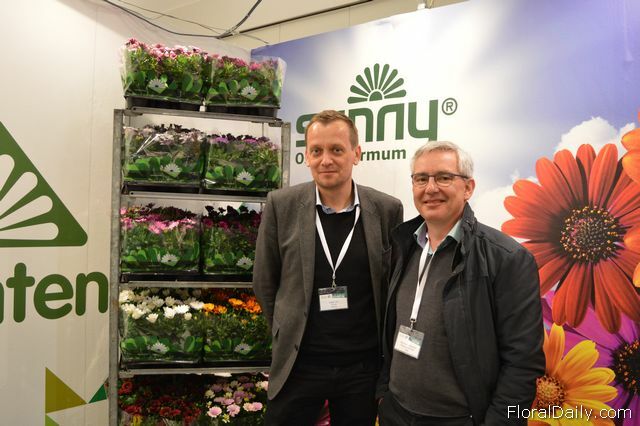 Niels Reinke and Sandy Reinke of Hans Reinke Baumschulen. 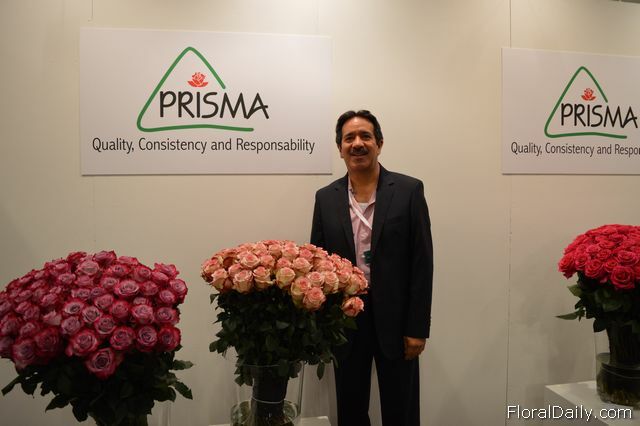 Edgar Mosquera Hoyos of Flores Prisma. 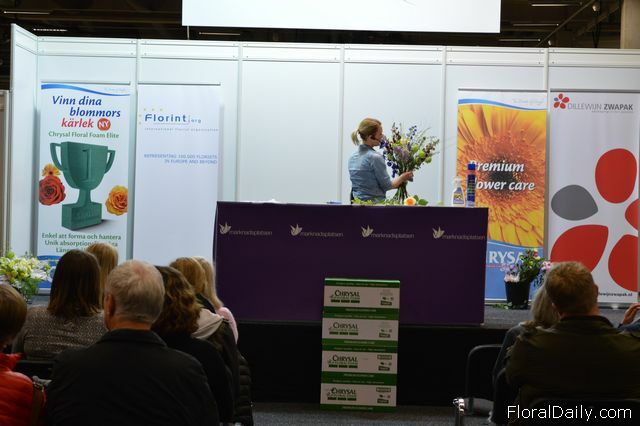 Kitty de Bruyn of Fair Flowers Fair Plants. 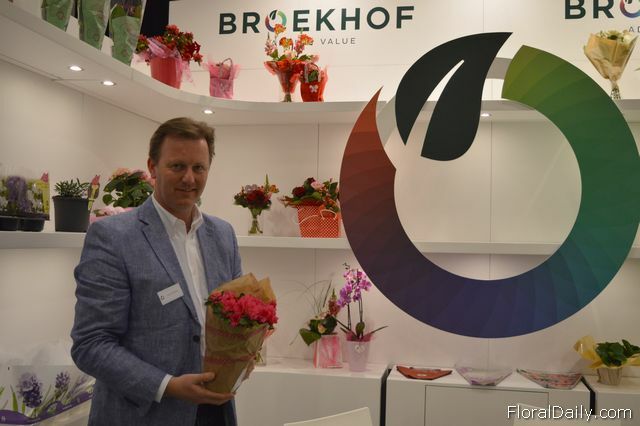 John van Berkel of Broekhof holding a new sleeve, called sleeve folding kraft dots. 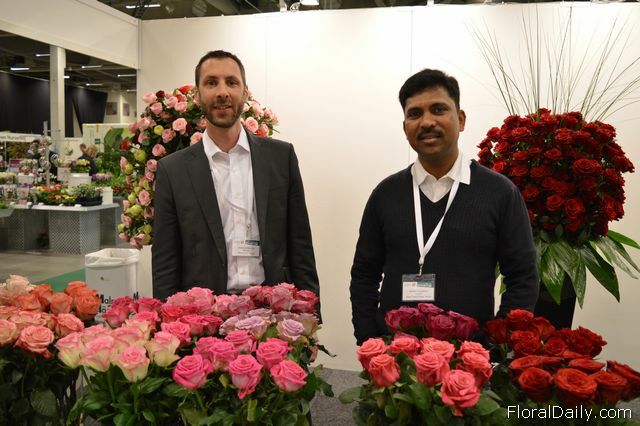 Stephane Maurice of Mfresh and Mohan Choudhery of Black Tulip. 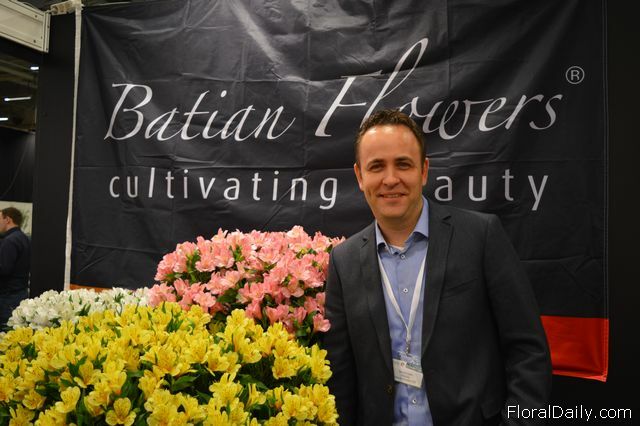 Maurice is a French importer of Black Tulip flowers. 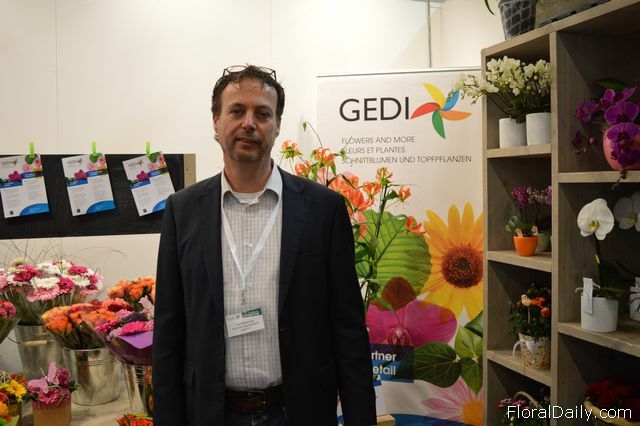 Piet Kelderman of Business Development Gedi. 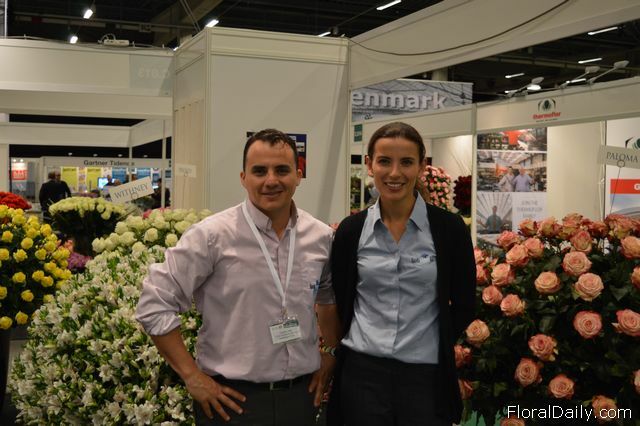 Vladimir Witt and Ingrid Ledesma of Garda Export. 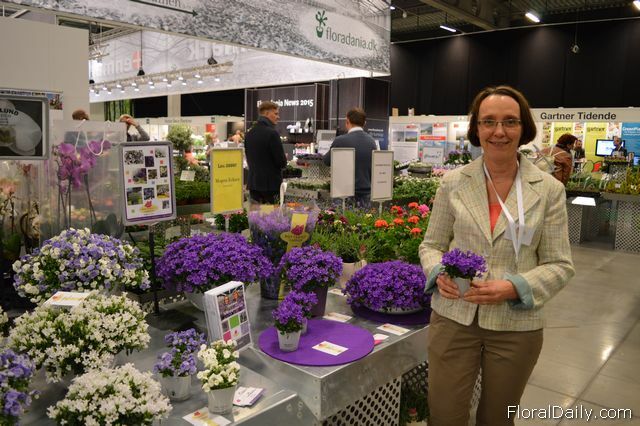 Helle Graff of Graff Kristensen. 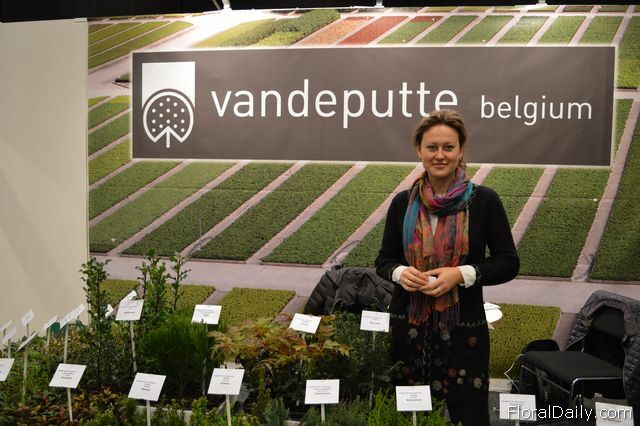 Elena of Van De Putte. 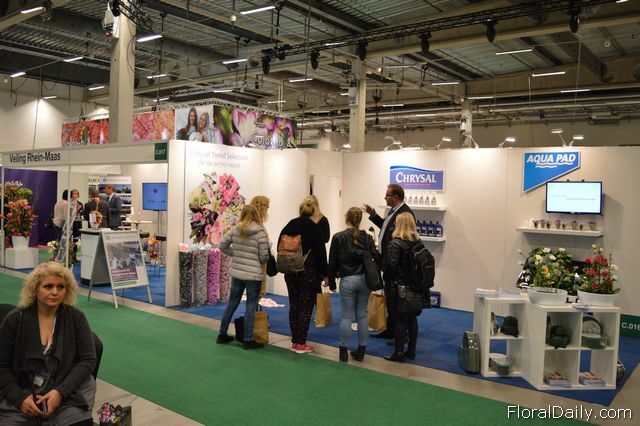 The booth of Gartner Sved Nielsen. 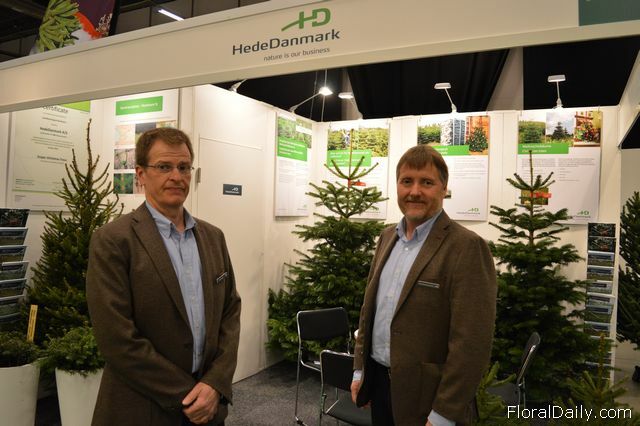 Rene Nielsen and Niels Arentoft of HedeDanmark. 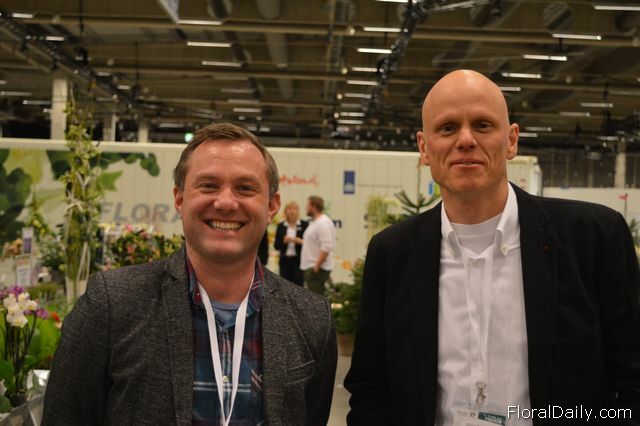 Jasper Slot of Sunny with Hans Gammelgaard of Jiffy. 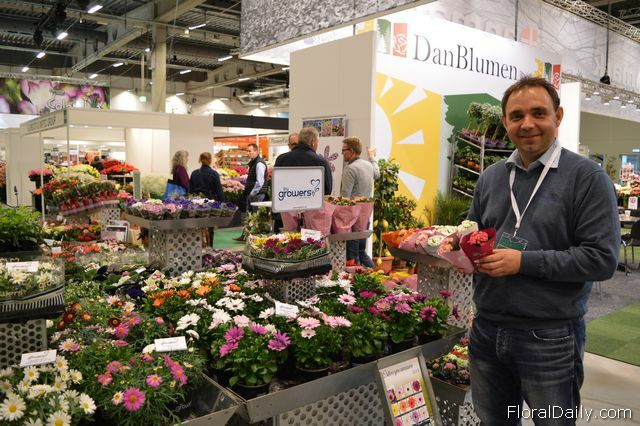 Hans supplies Sunny with Jiffy substrates. 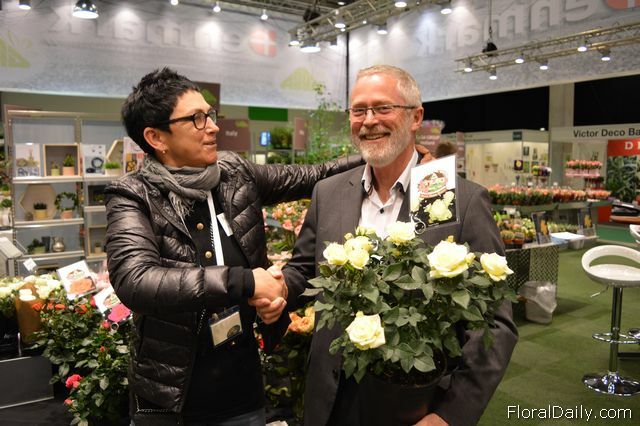 Michel Wolvers of Nolina, holding the new two colored rose, called Noriko Hit of the PatioHit Collection. 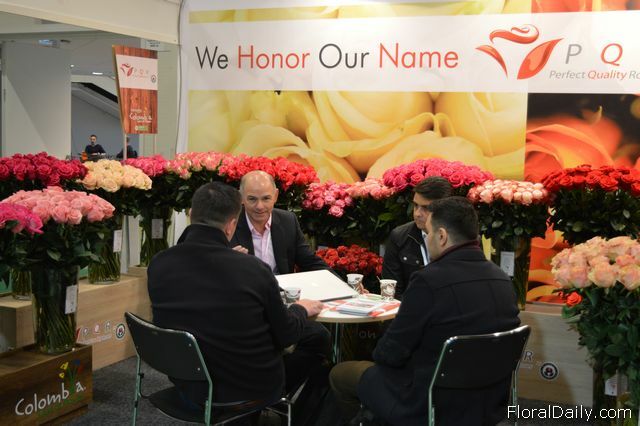 Ernesto Davila of Sunrite Farms Ecuador talking with visitors. 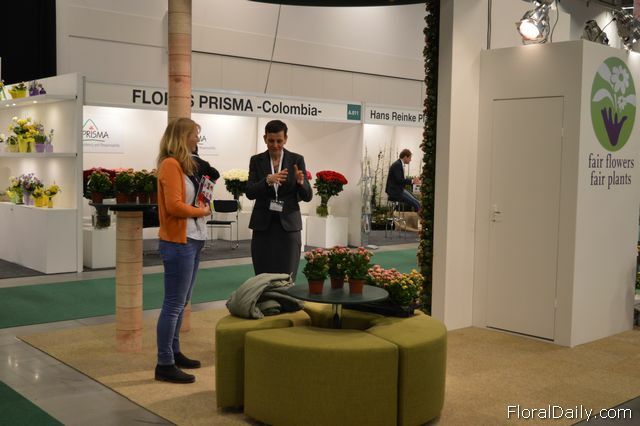 Juan Manuel Gutierrez of PQR talking with visitors. 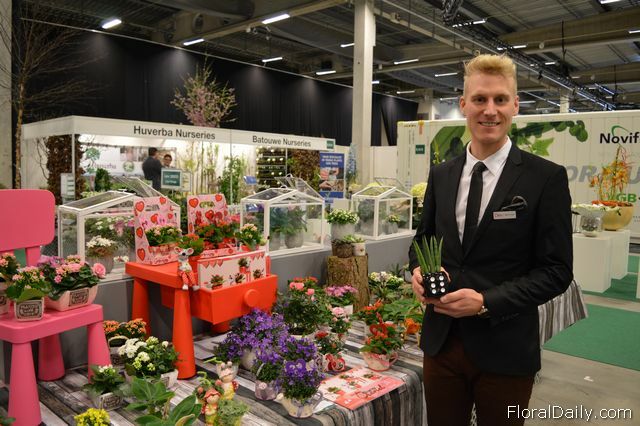 Ronny Koo of DTK Greenhouse. 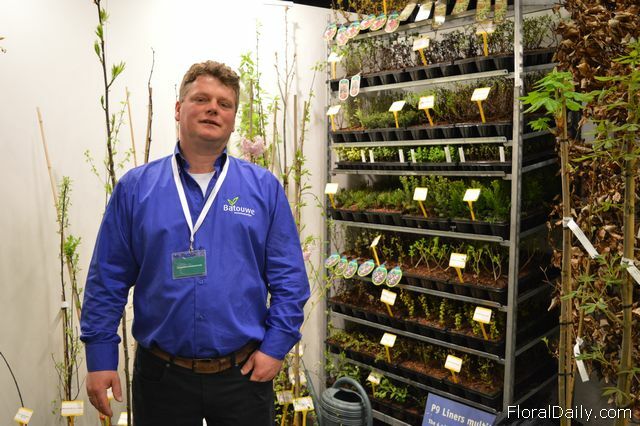 Henk Huibers of Batouwe Boomkwekerijen. 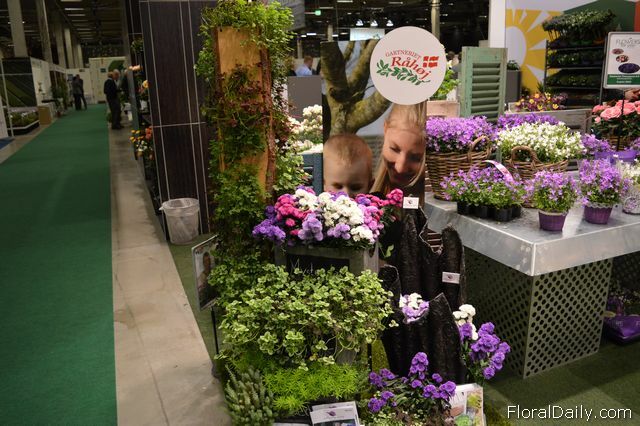 The booth of Family Plants. 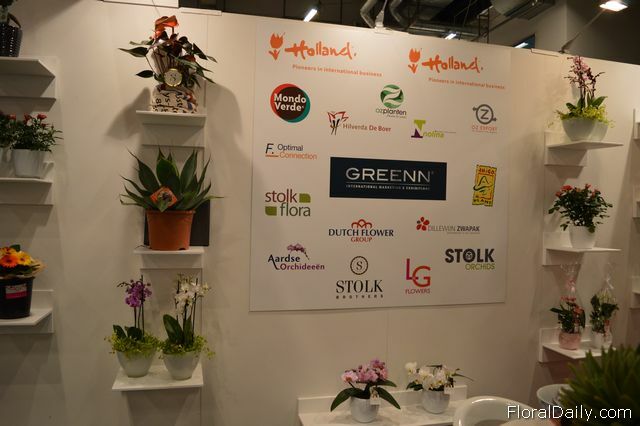 Jan-Paul Rijke of Green Partners. 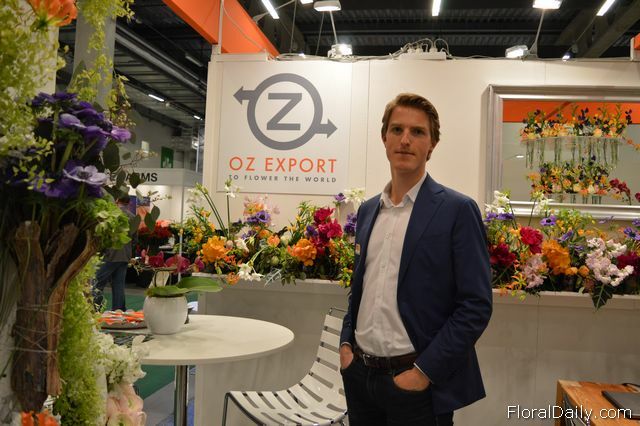 Ron Groot of OZ Export. 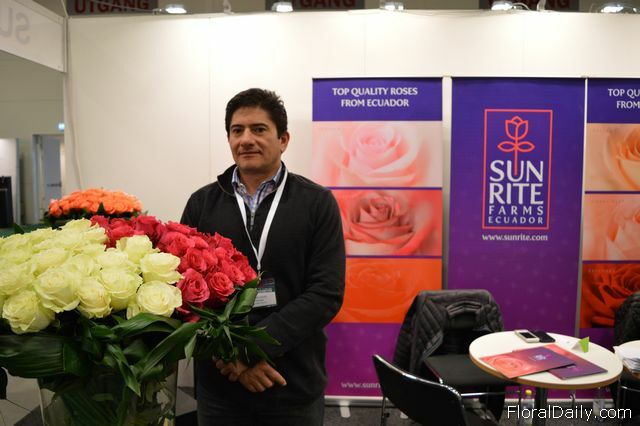 Ernesto Davila of Sunrite Farms Ecuador. 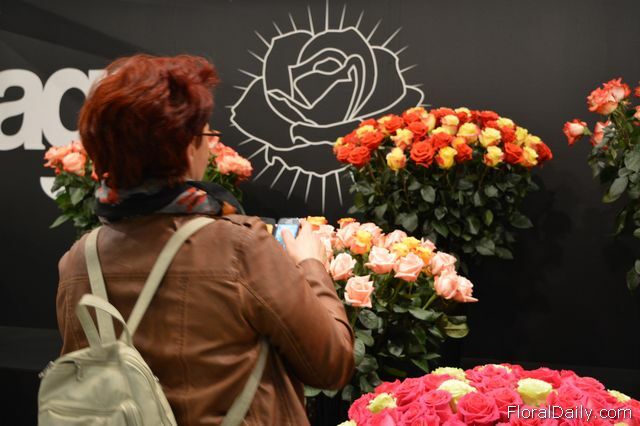 Visitor making pictures of the roses of El Milagro. 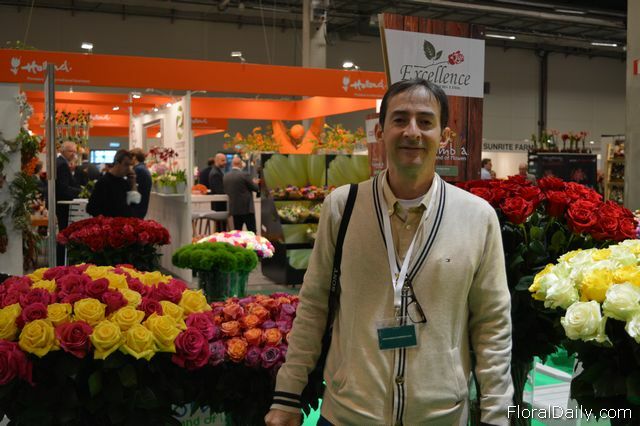 Mauricio Danies L. of El Milagro. 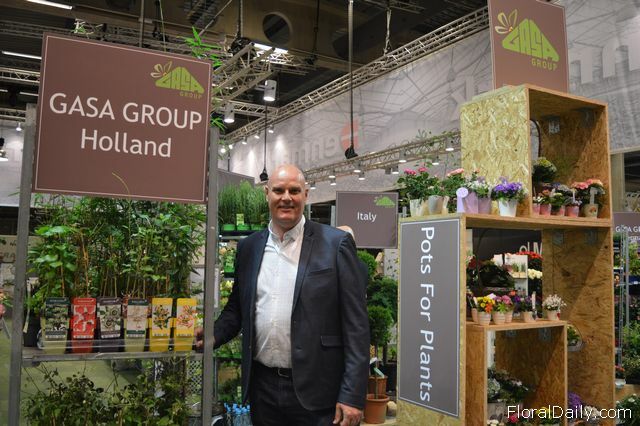 Rene Terlouw of GASA Holland. 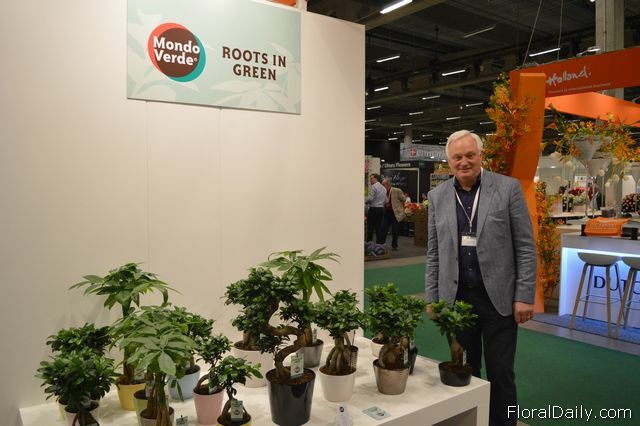 Louis Bakker of Mondo Verde. 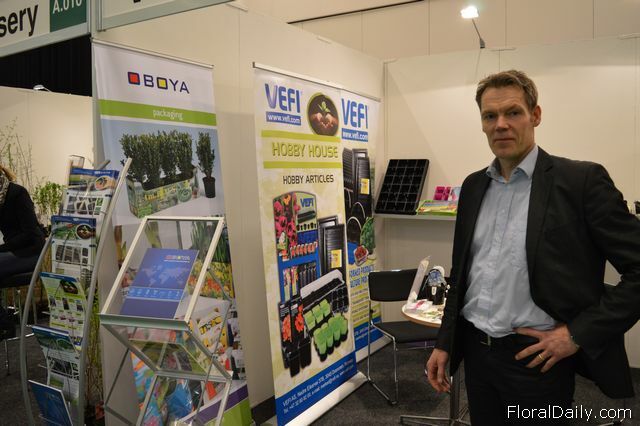 Verner Vest of Elmer Print. 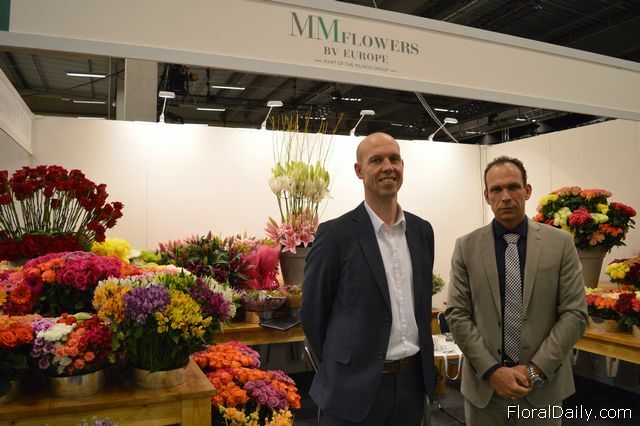 Jurgen de Vries and Kjeld van der Rijst of MM Flowers. 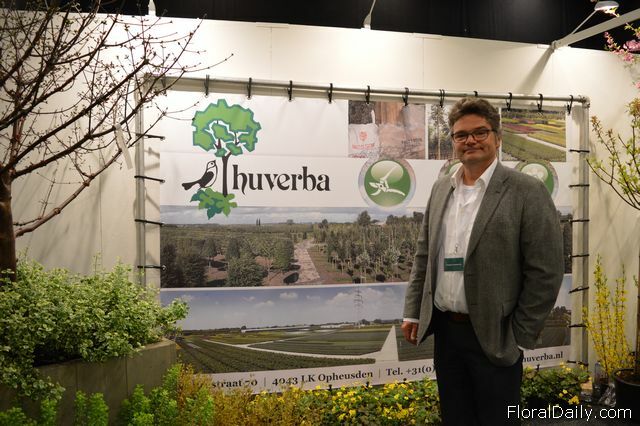 Dickk Huibers of Huverba Boomkwekerijen. 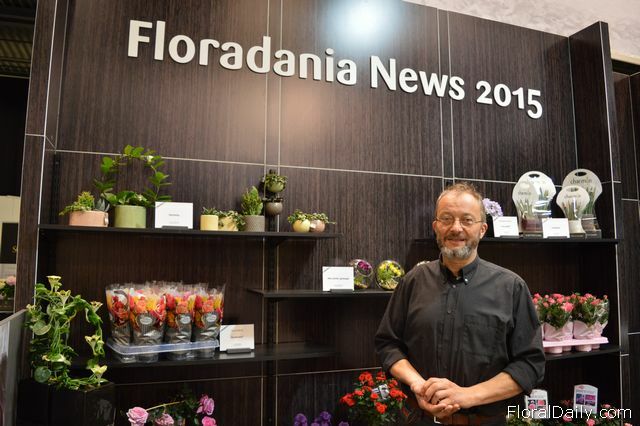 Benny Vernstrom Thomsen of Floradania Marketing. 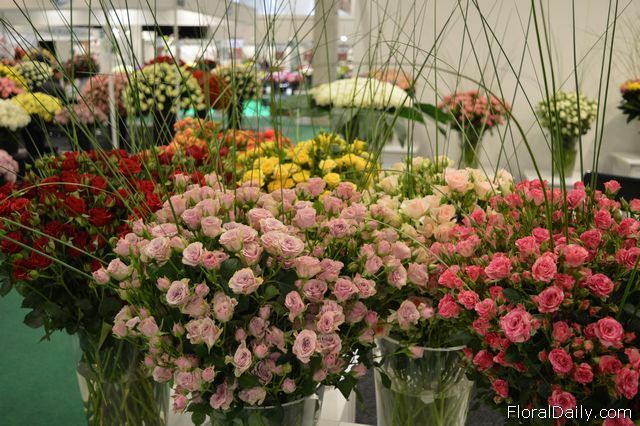 The booth of Flowers for you. 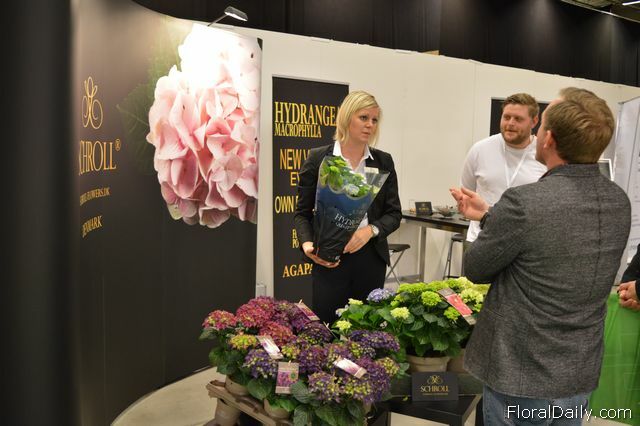 Stine Garbo Schroll and Christian Garbo of Schroll Flowers talking with visitors. 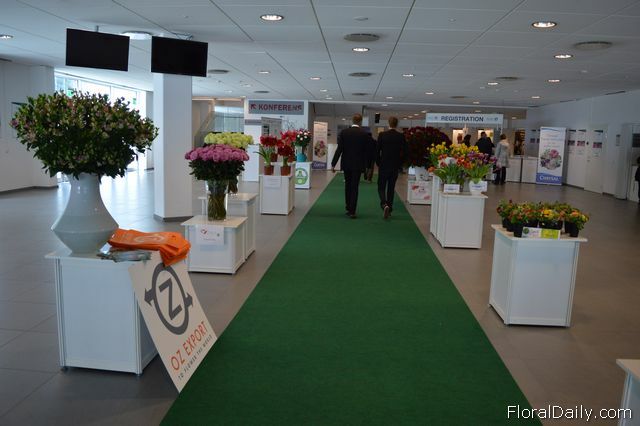 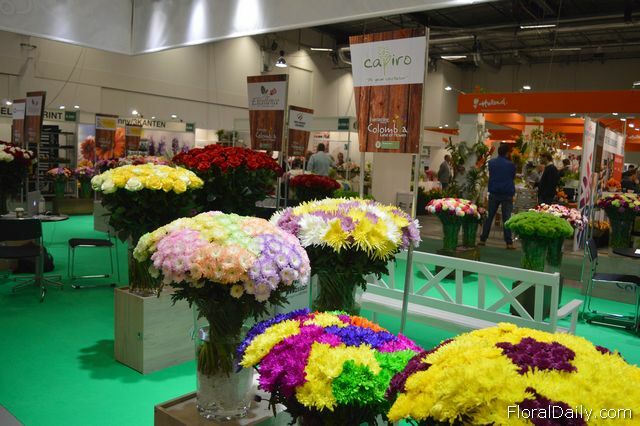 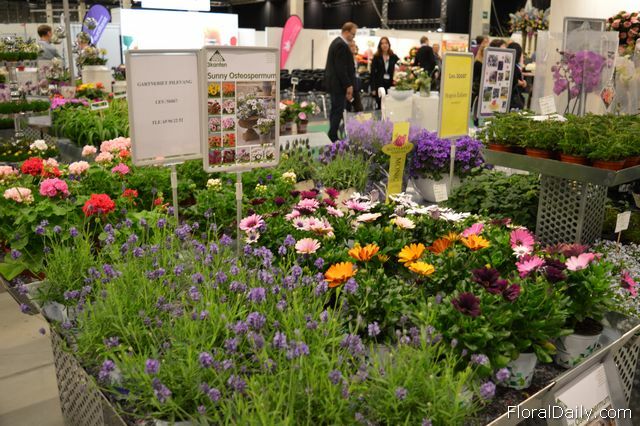 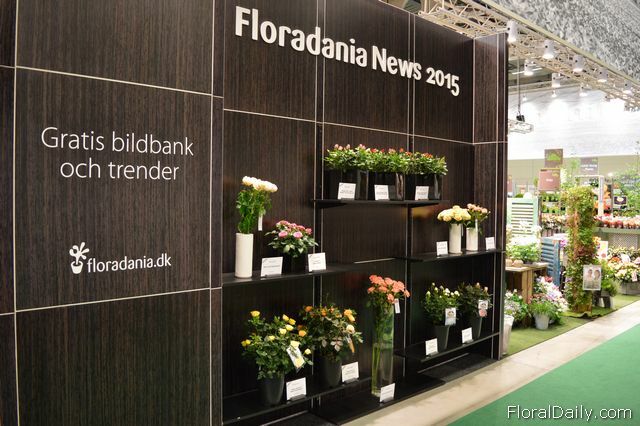 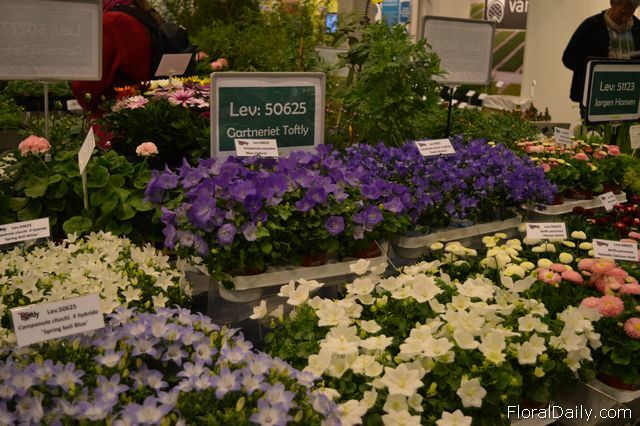 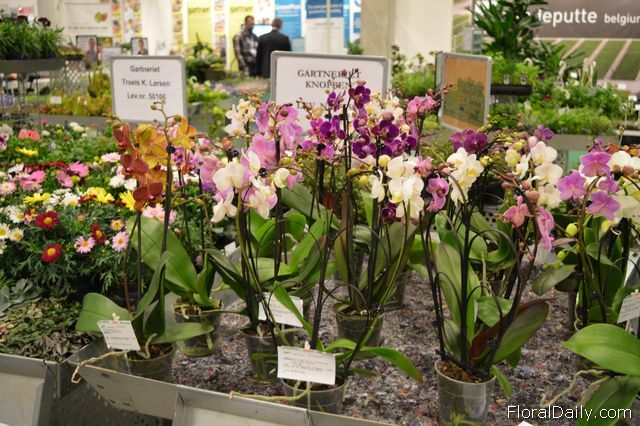 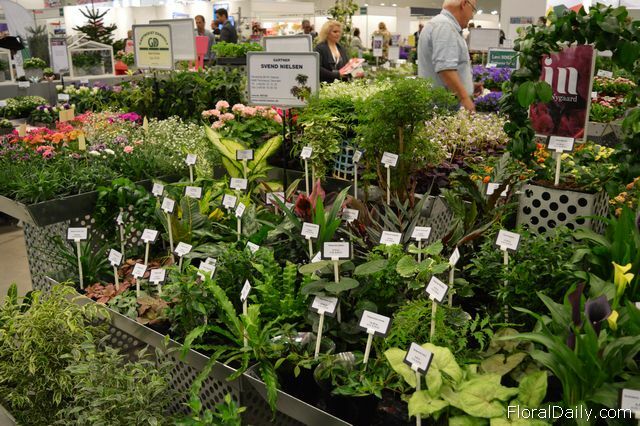 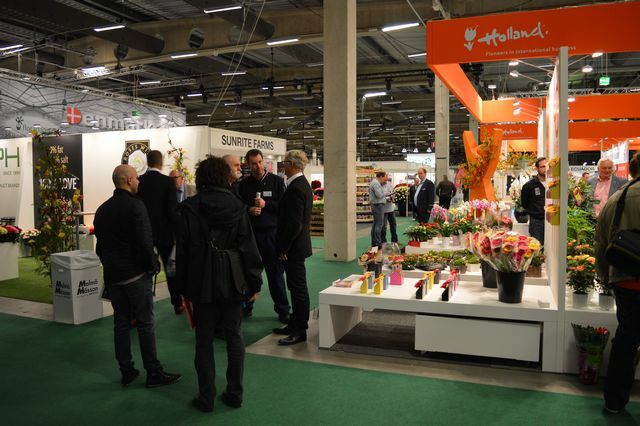 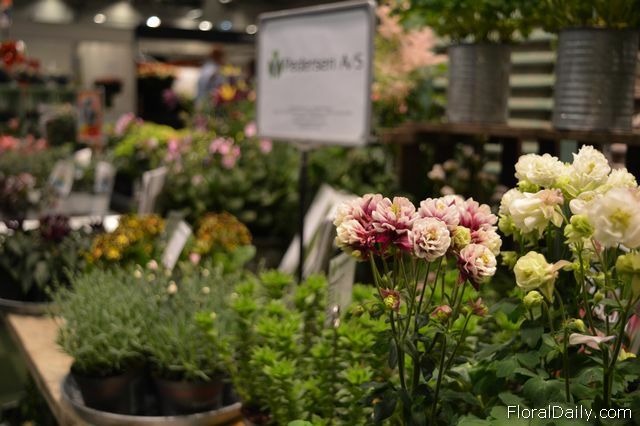 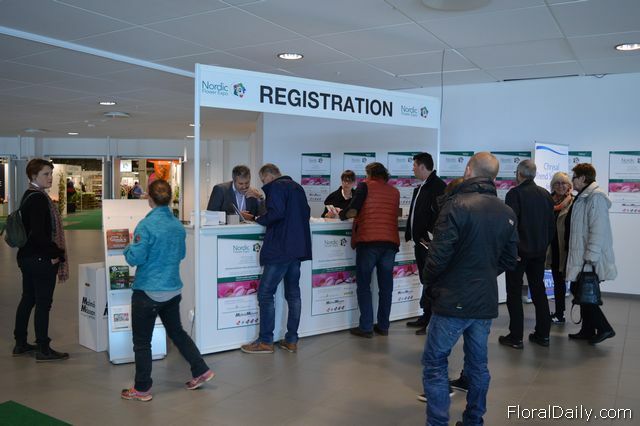 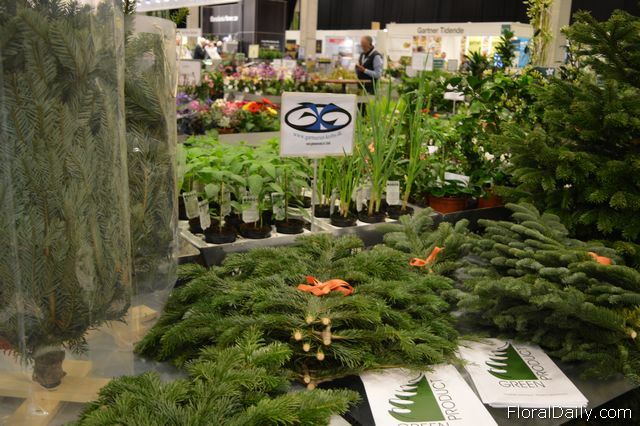 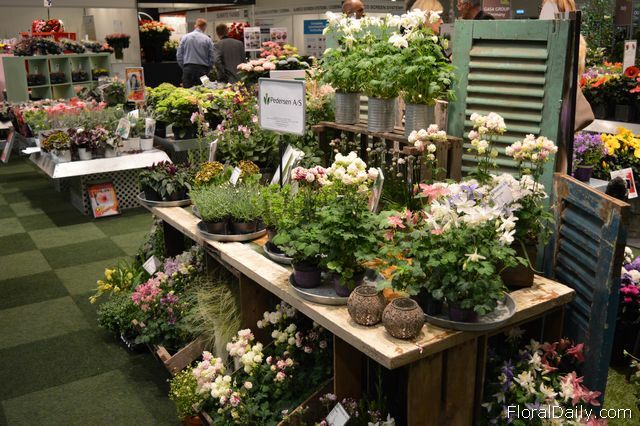 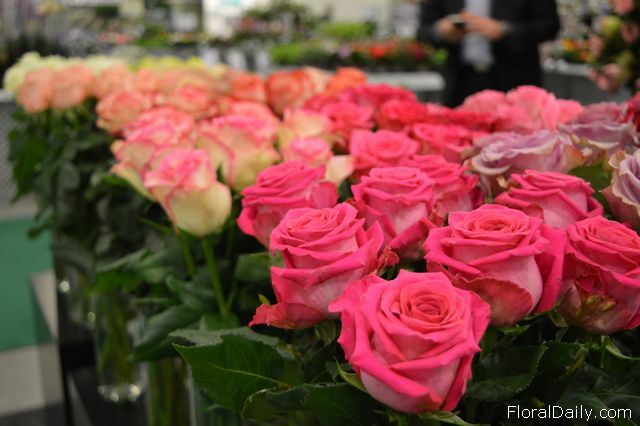 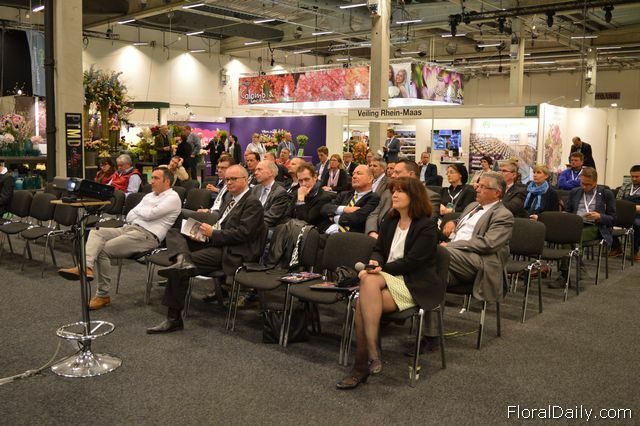 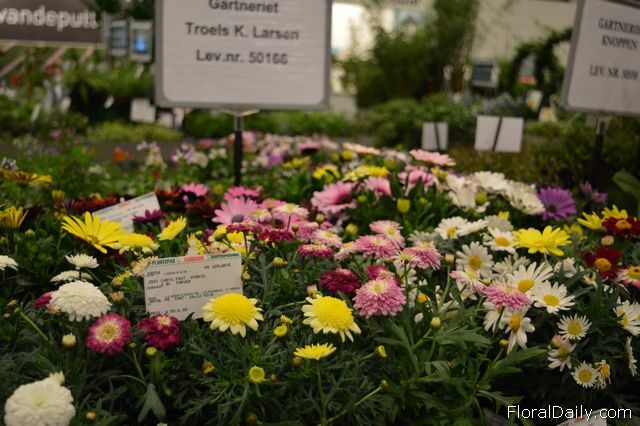 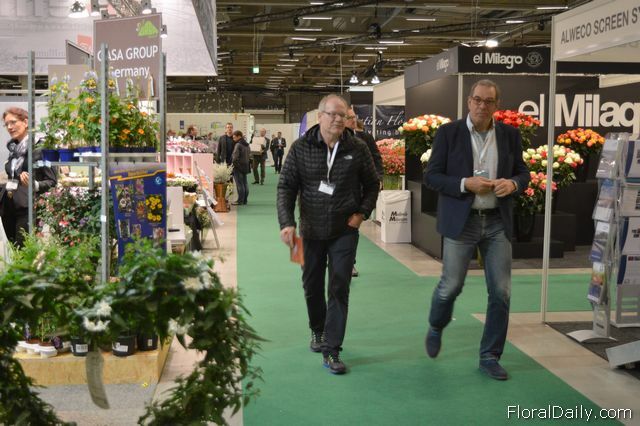 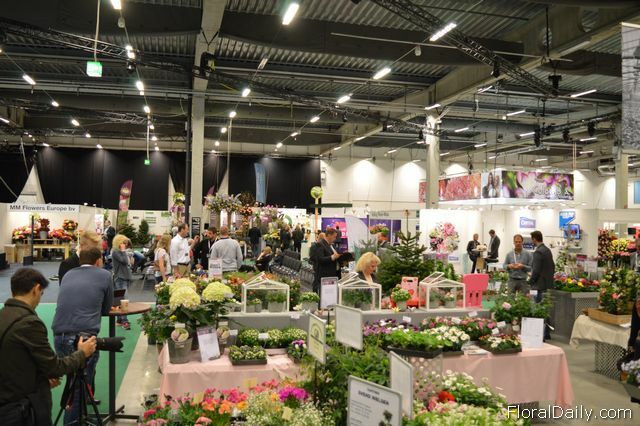 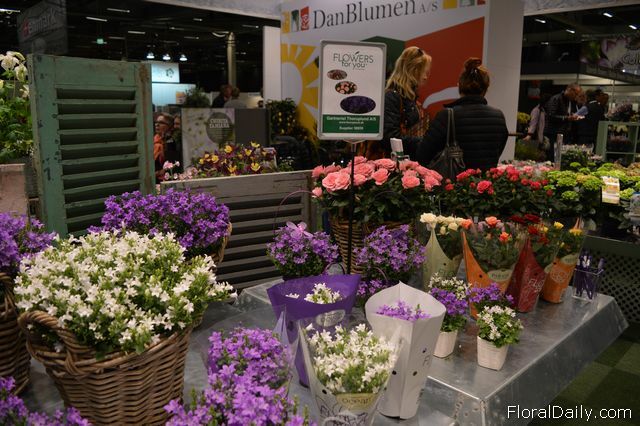 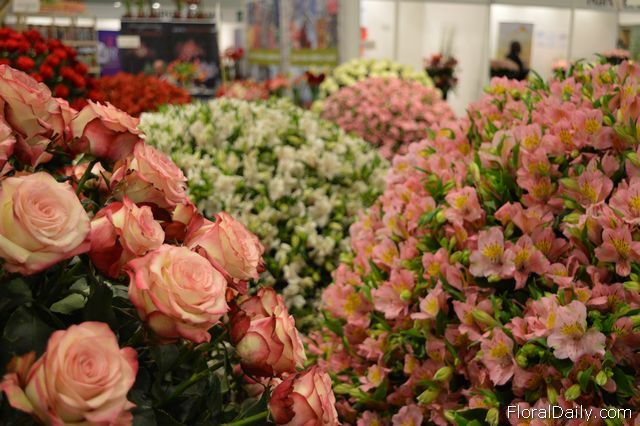 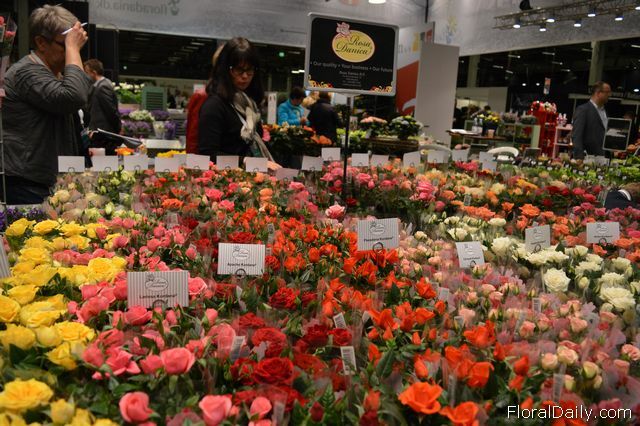 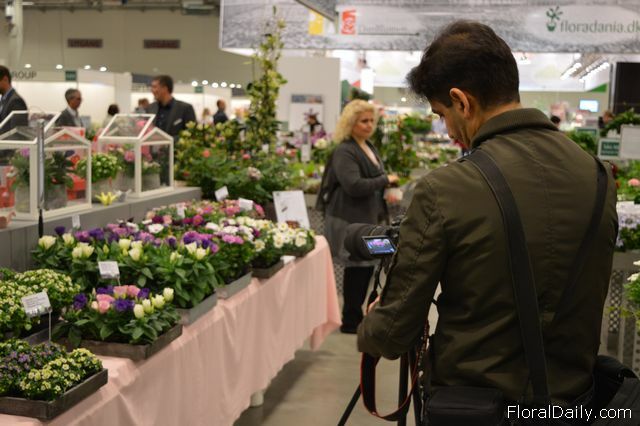 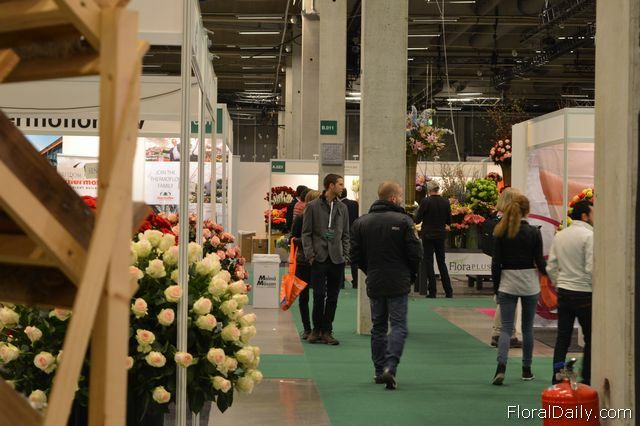 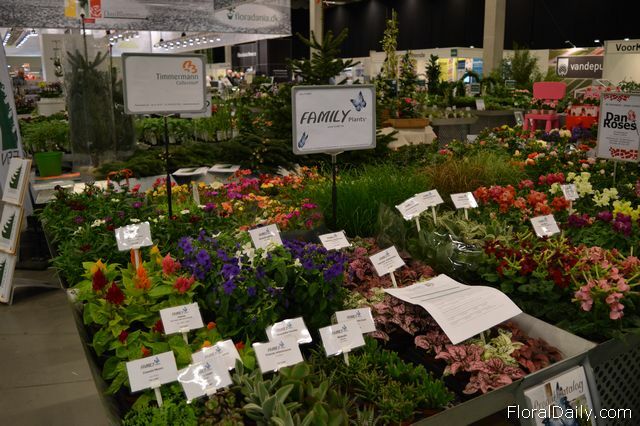 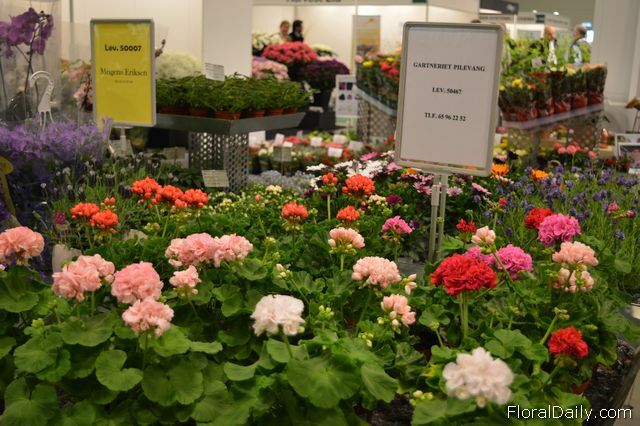 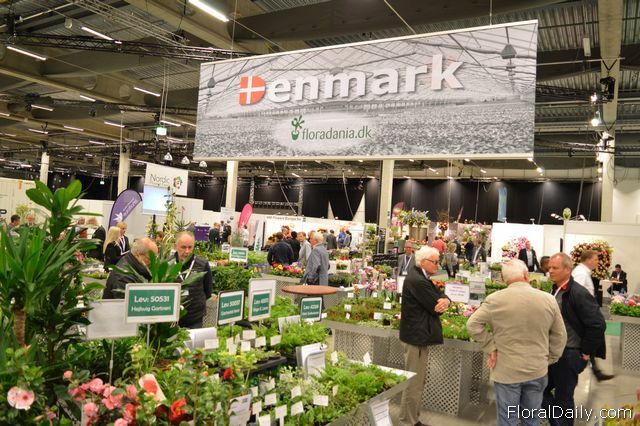 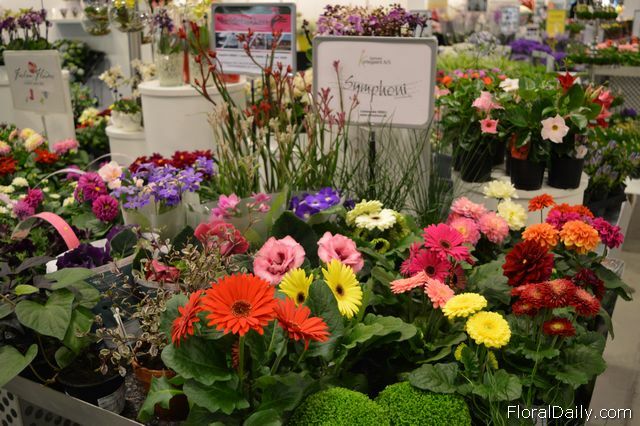 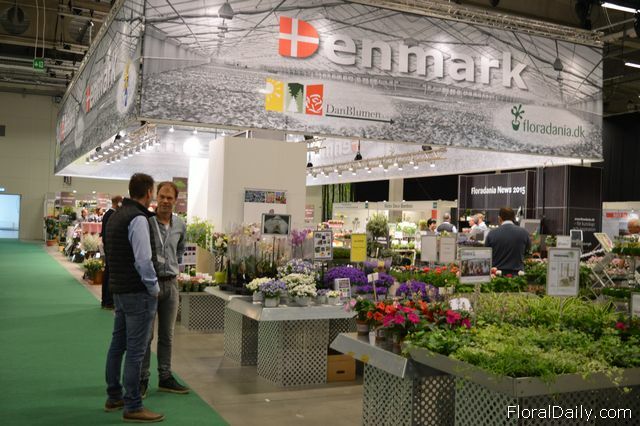 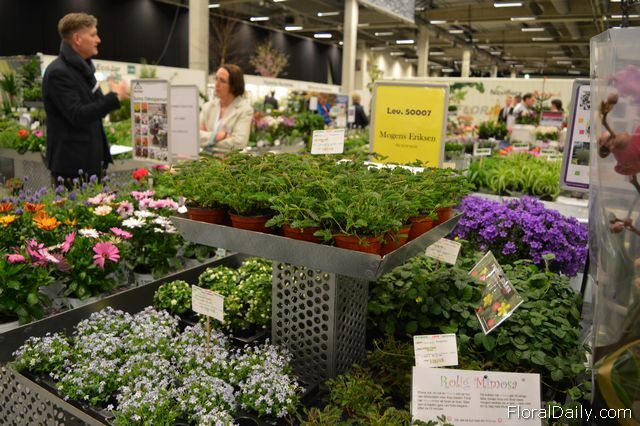 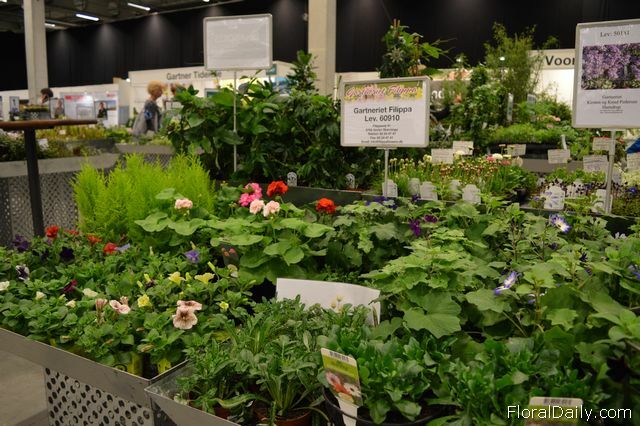 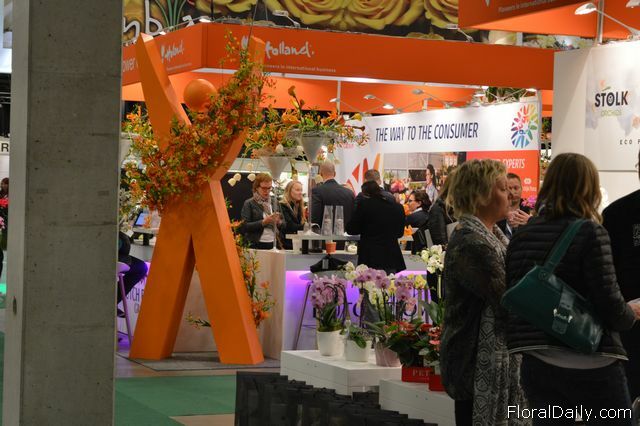 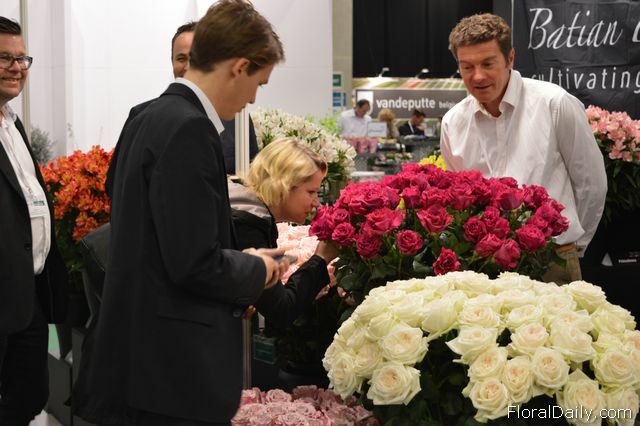 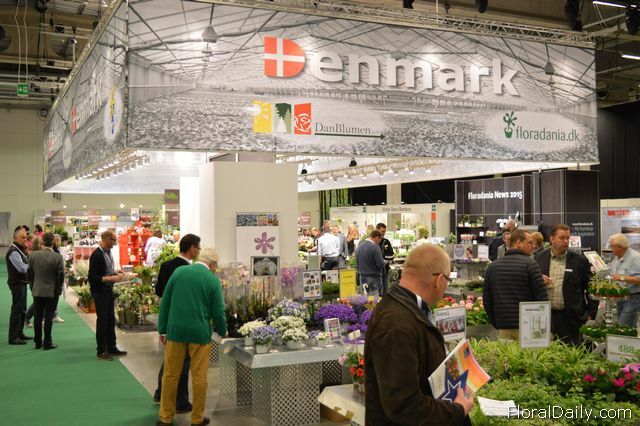 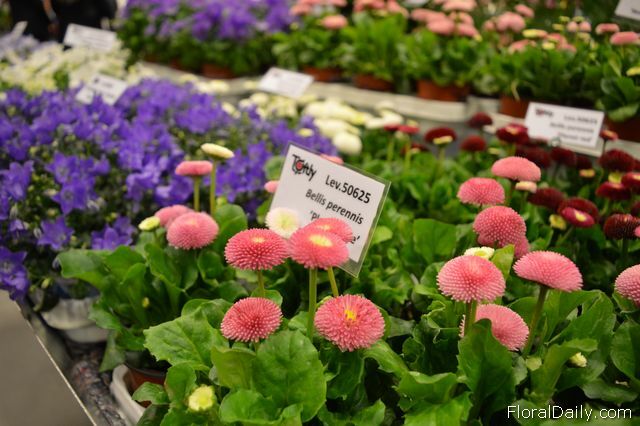 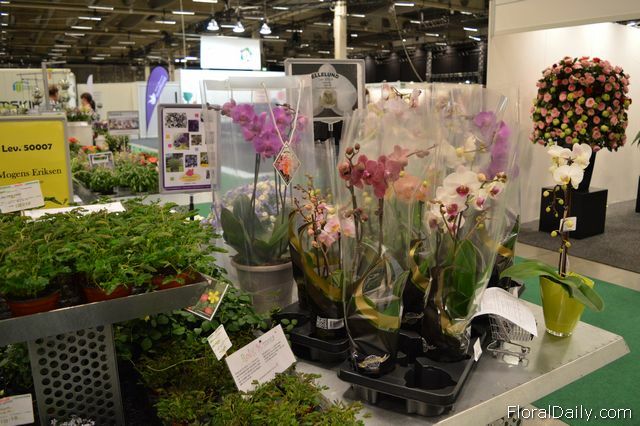 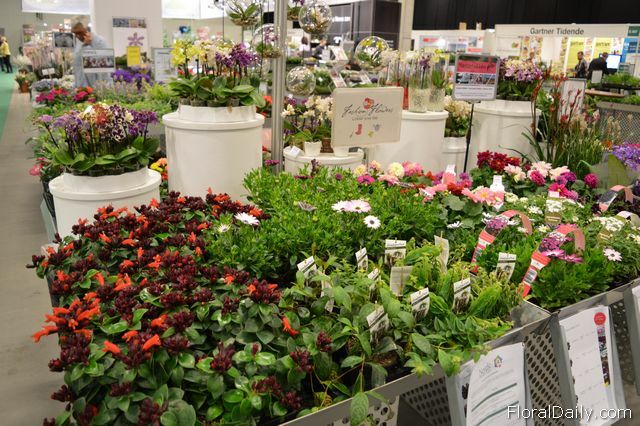 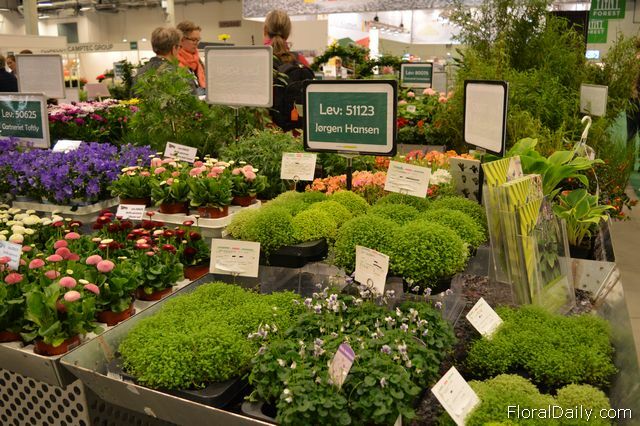 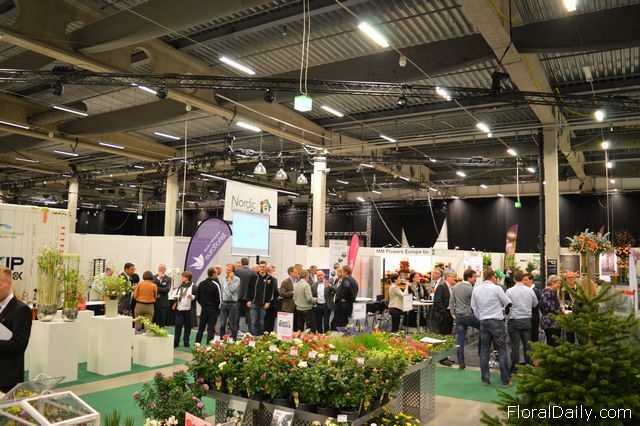 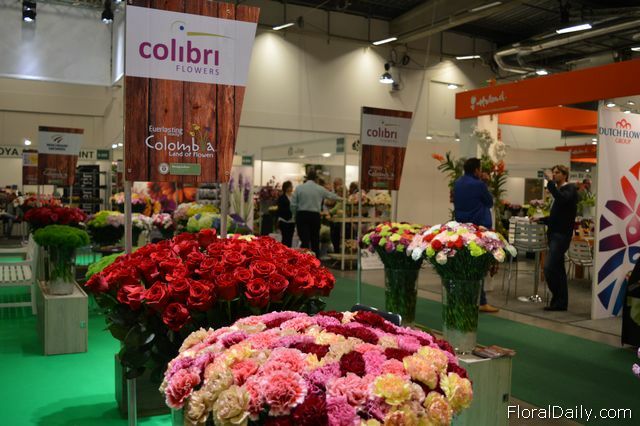 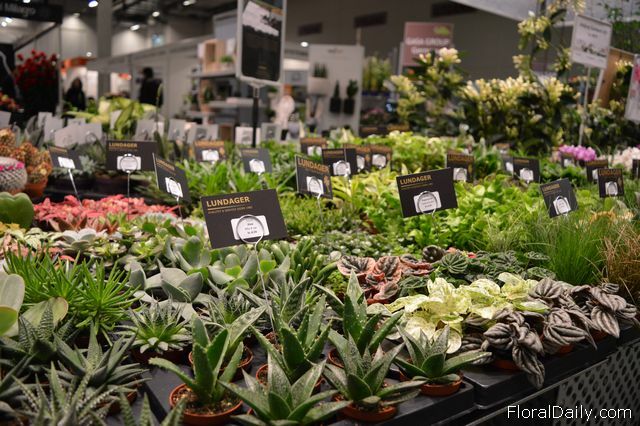 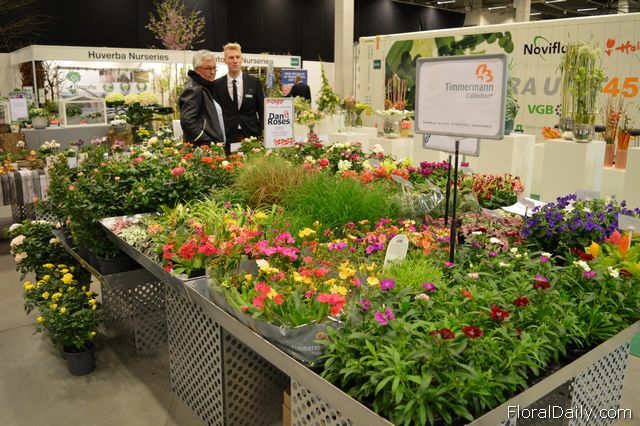 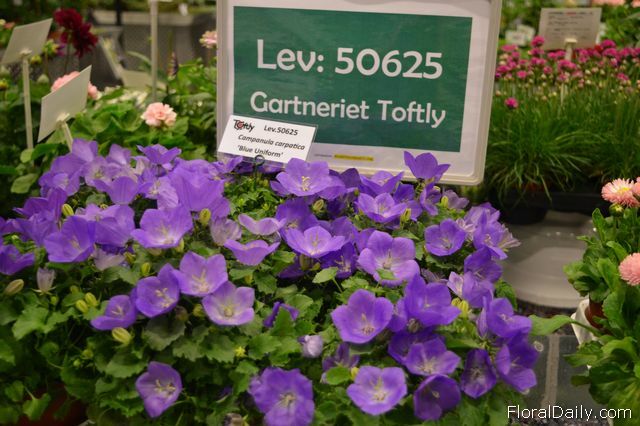 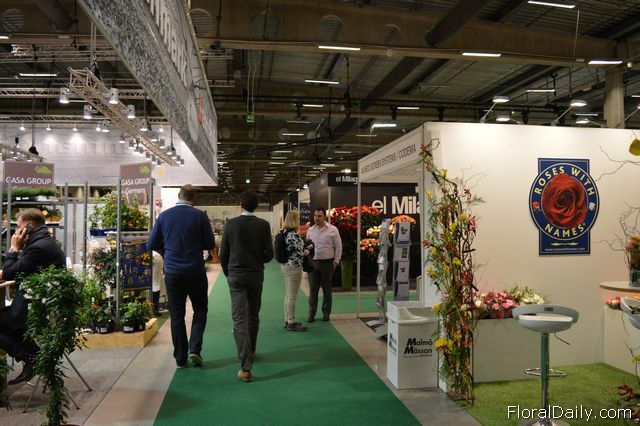 Floradania exhibiting the new Danish flowers and plants. 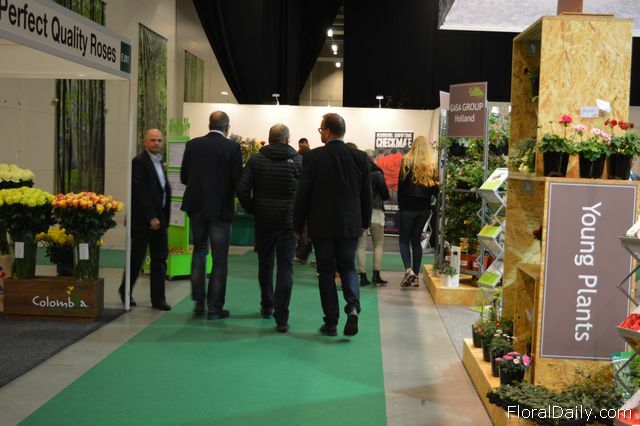 Visitors looking at the stand of By Growers. 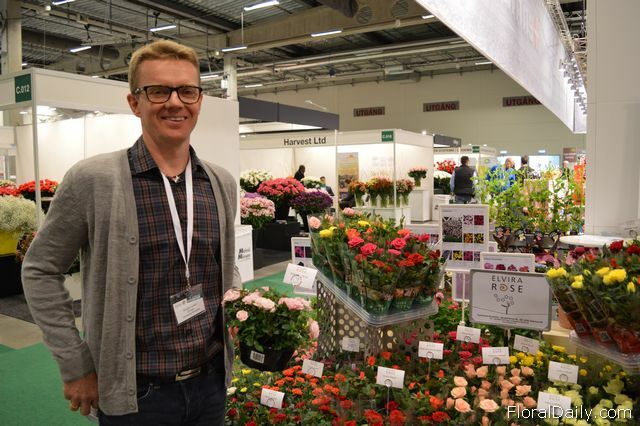 Jesper Madsen of By Growers holding three the Grand Divas. 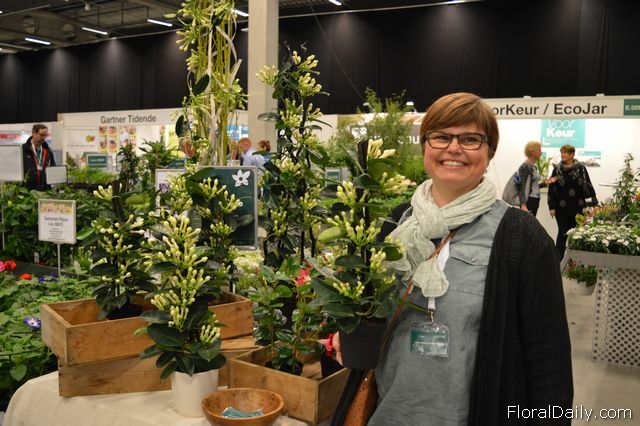 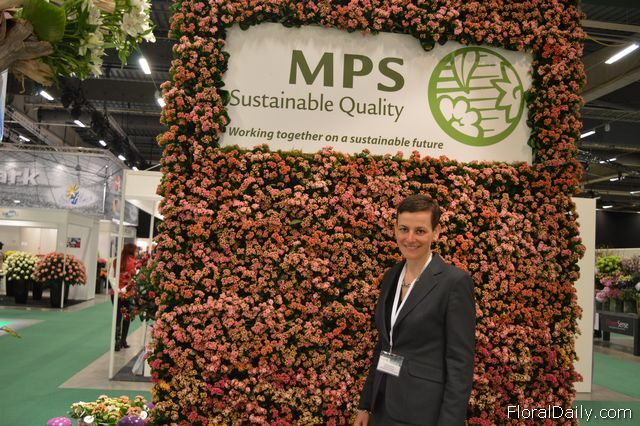 Kirsten Ladegaard Andersen of Kjeld Jansen holding the new Stephanotis. 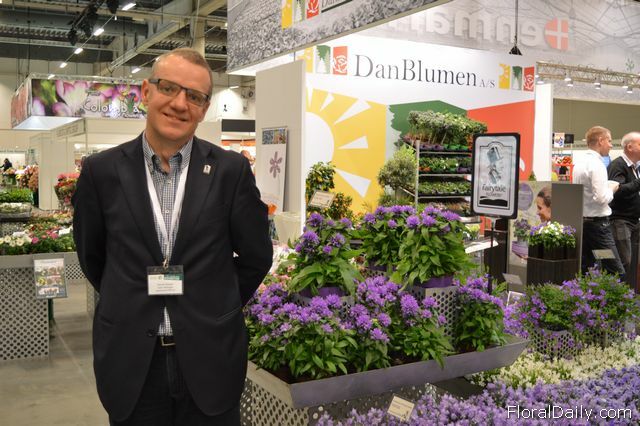 Martin Kragh of Euro Trend holding the new dice for 6-10 cm plants. 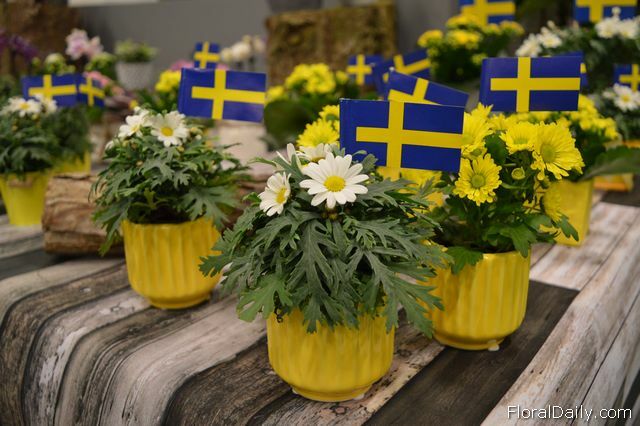 Made for the Finnish Father's Day. 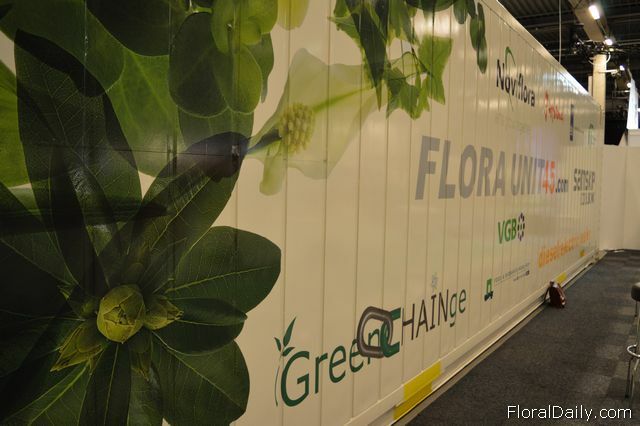 The container of the GreenCHAINge project. 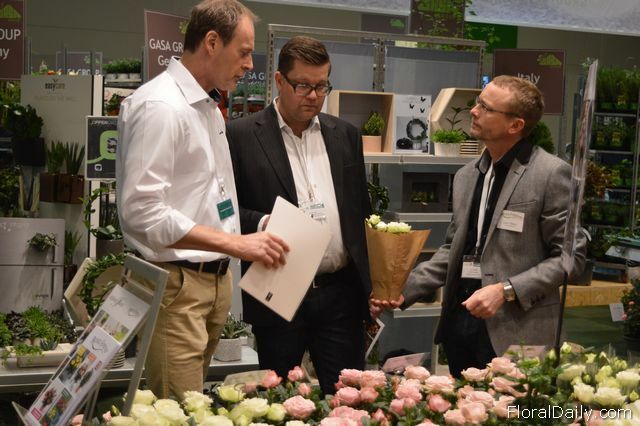 Fredrik Engvall of Chrysal talking with visitors. 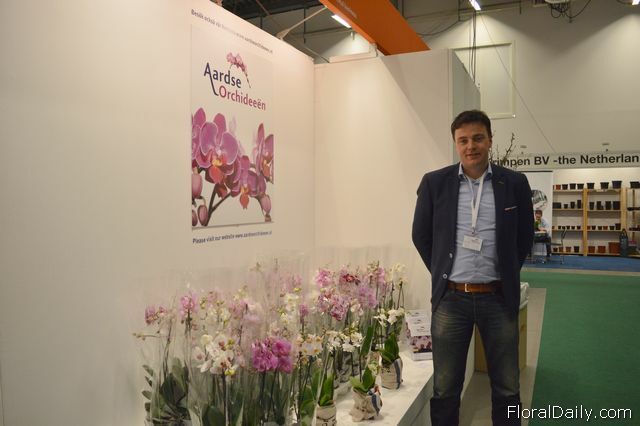 Wouter Konijn of Aardse Orchideeën. 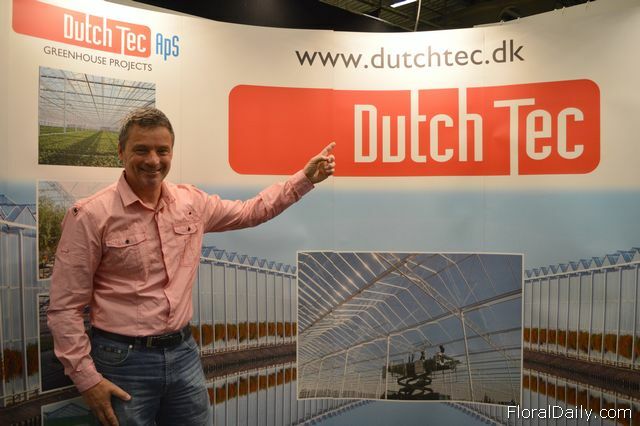 Marc van Heijningen of Schoneveld Breeding was visiting the show. 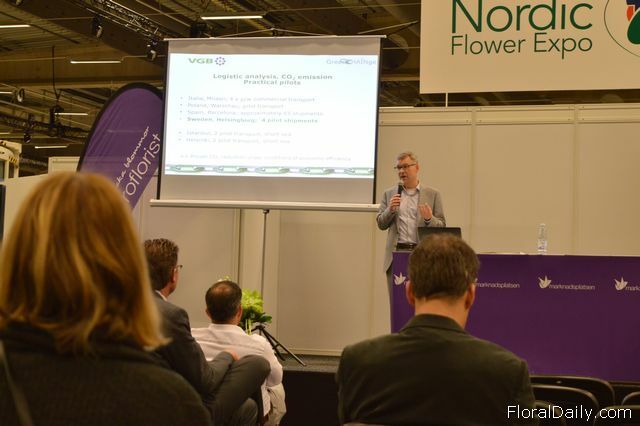 Peter Scroll Petersen of Green Product. 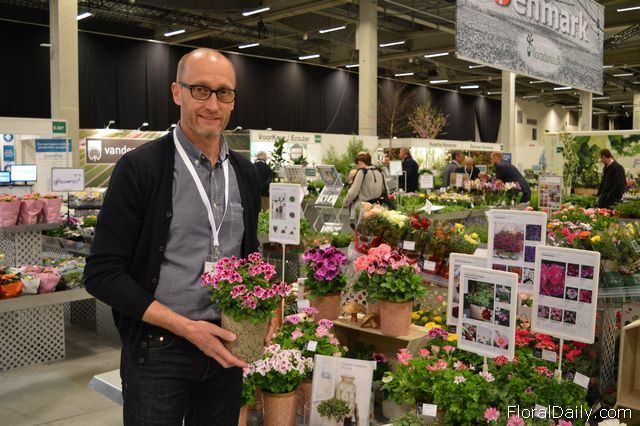 "Per Christensen of Gartneriet Tingdal holding the Pelargonium Petit "Sweet Pink"." 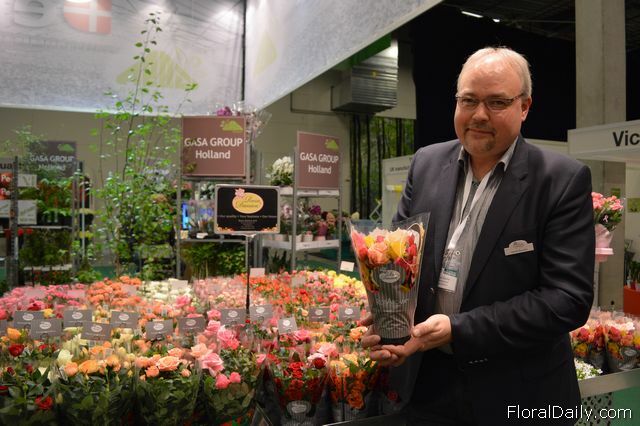 Michael Larsen of Elvira Rose holding the Gloria Q-IRose. 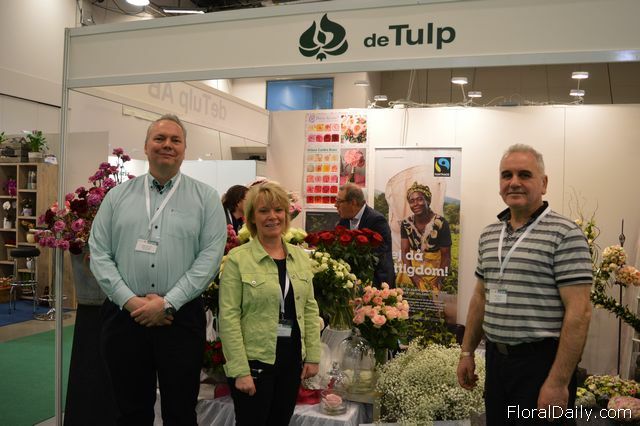 Mikael Jönsson, Annette Heuller and Abbas Bagher of De Tulp. 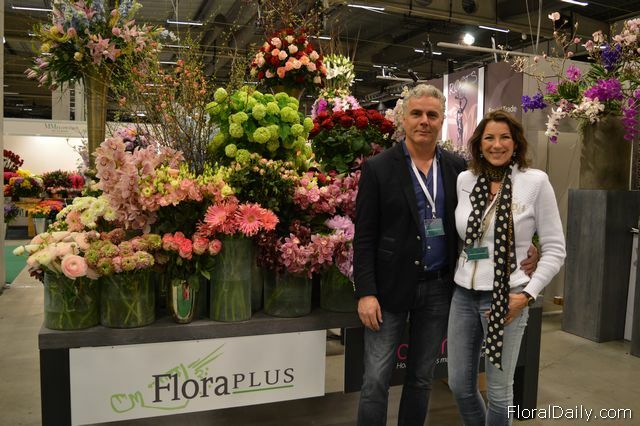 Ron Hooyman of Floraplus and Nicolette Hooyman of FlowerSense. 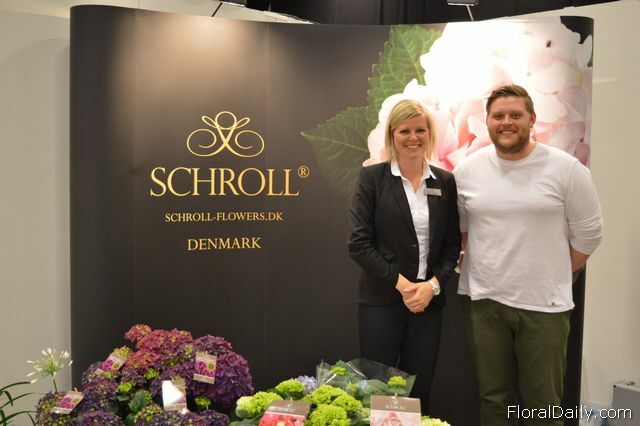 Stine Garbo Schroll and Christian Garbo of Schroll Flowers. 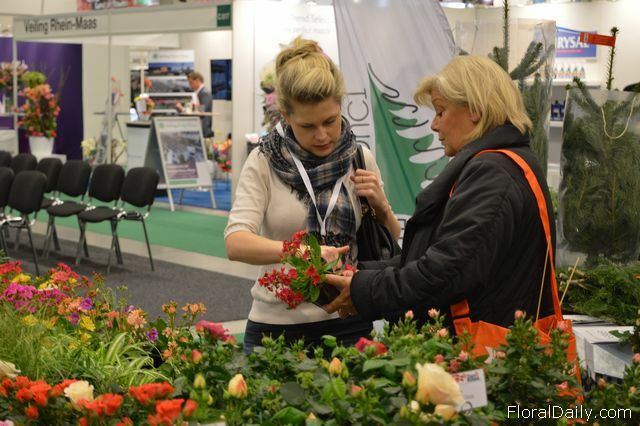 Kitty Bruyn talking of Fair Flowers Fair Plants talking with a visitor of the show. 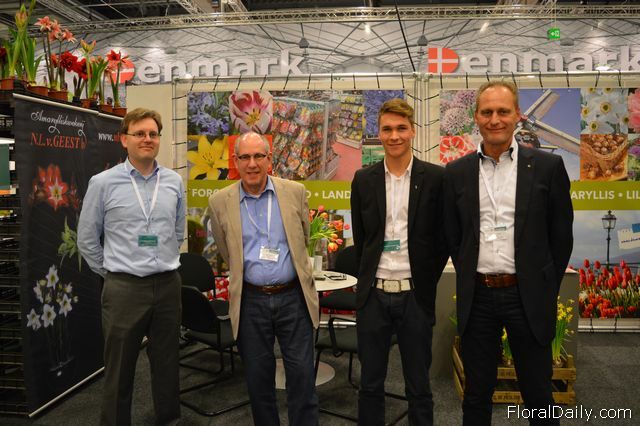 Lars Felsted and Frank Büssing of Pöppelmann were visiting the show. 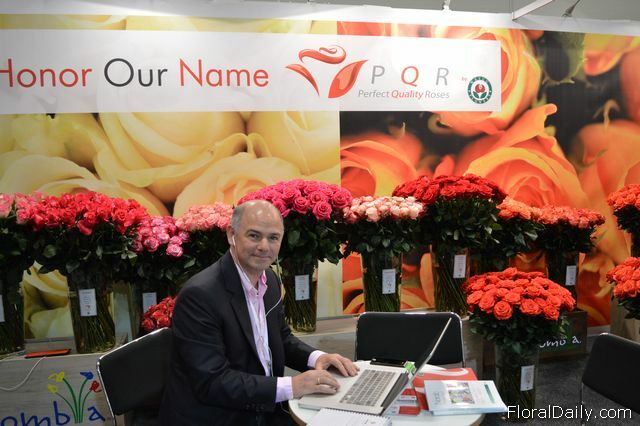 Juan Manuel Gutierrez of PQR. 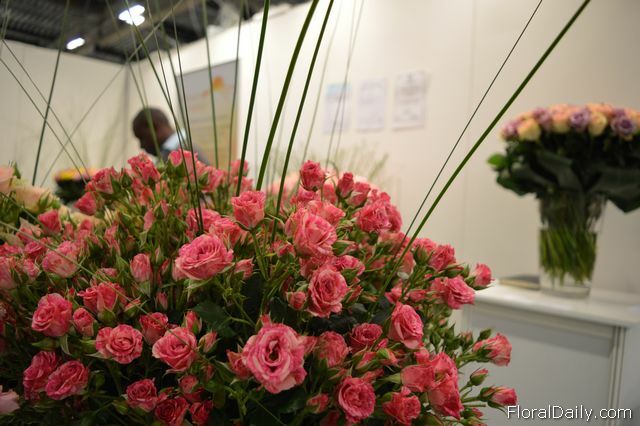 Visitors looking and smelling at the roses of Uhuru Flowers. 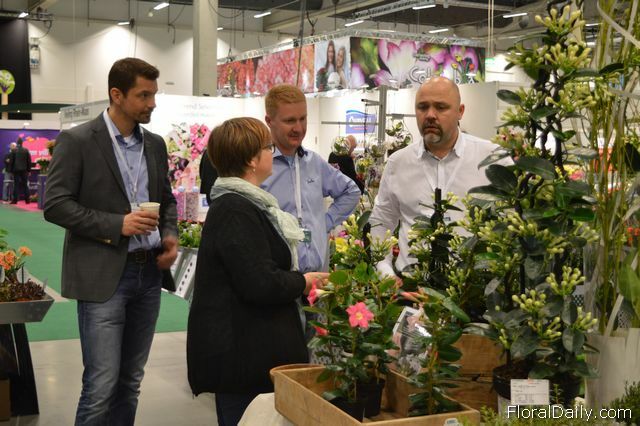 Kirsten Ladegaard Andersen of Kjeld Jansen talking with visitors. 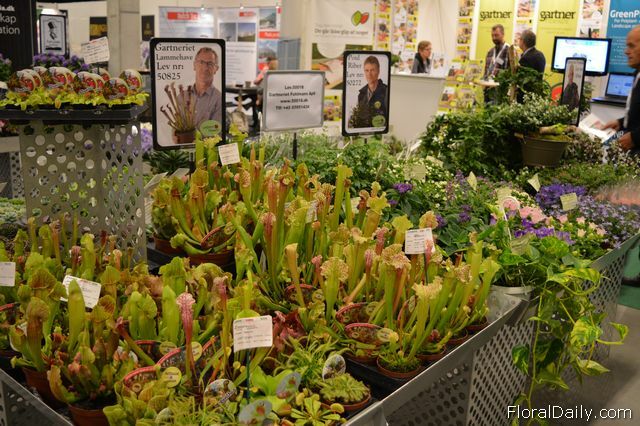 Visitors looking at the plants. 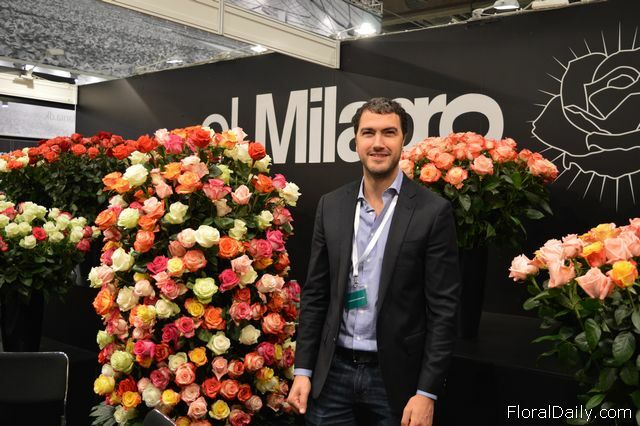 The roses of Garda Export.